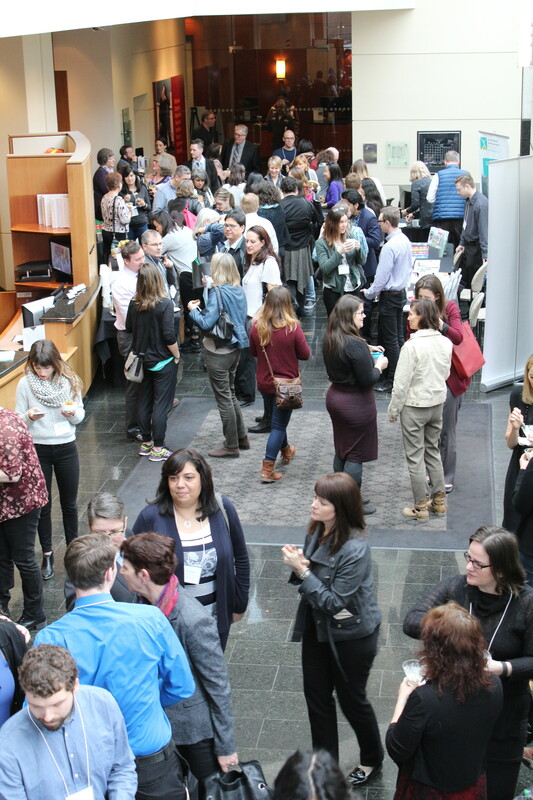 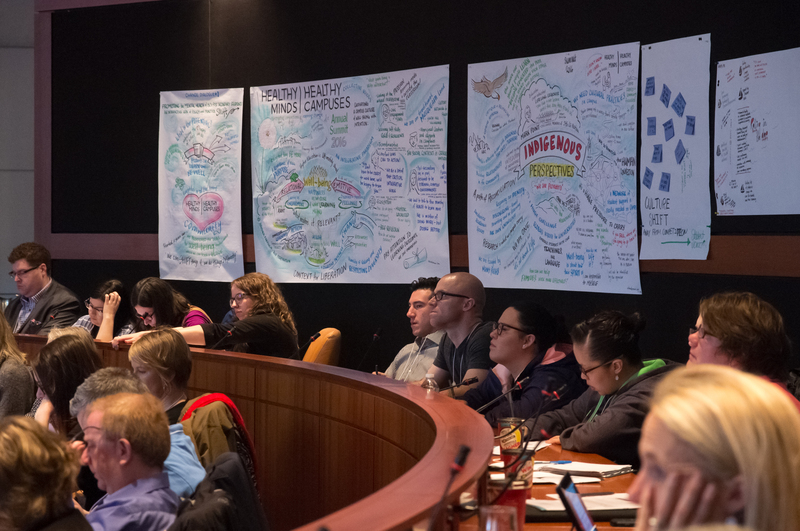 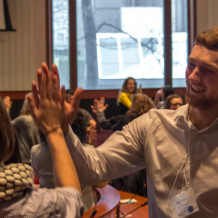 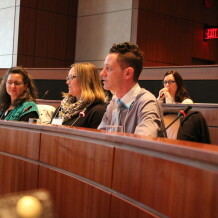 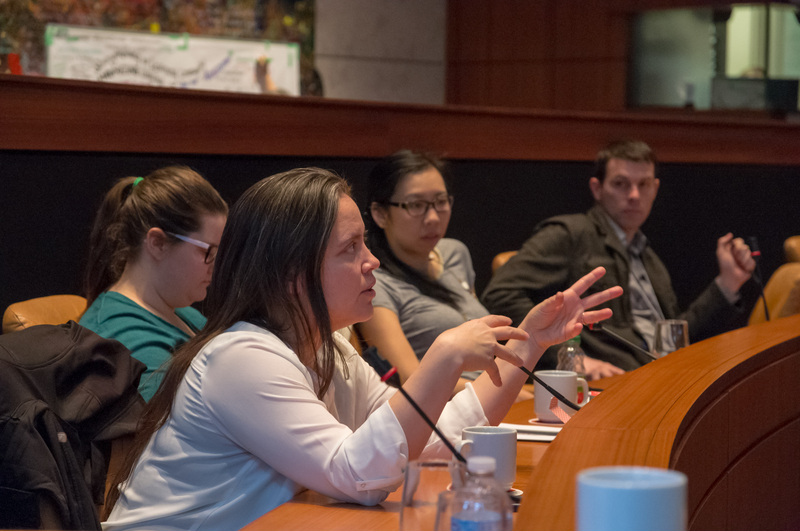 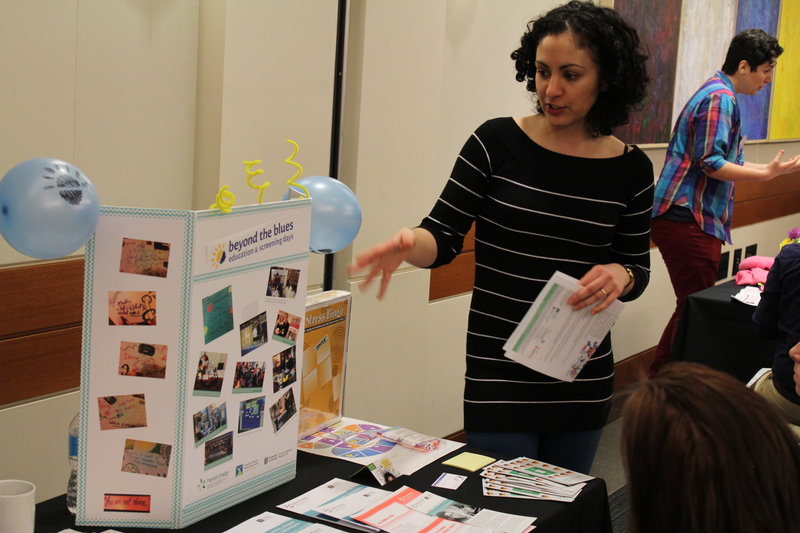 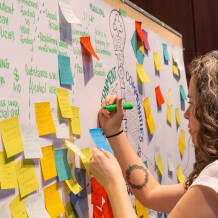 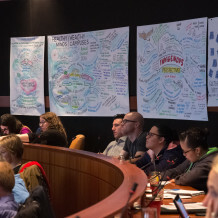 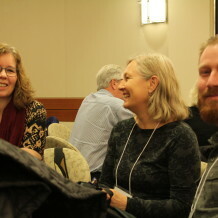 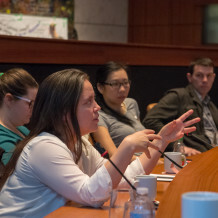 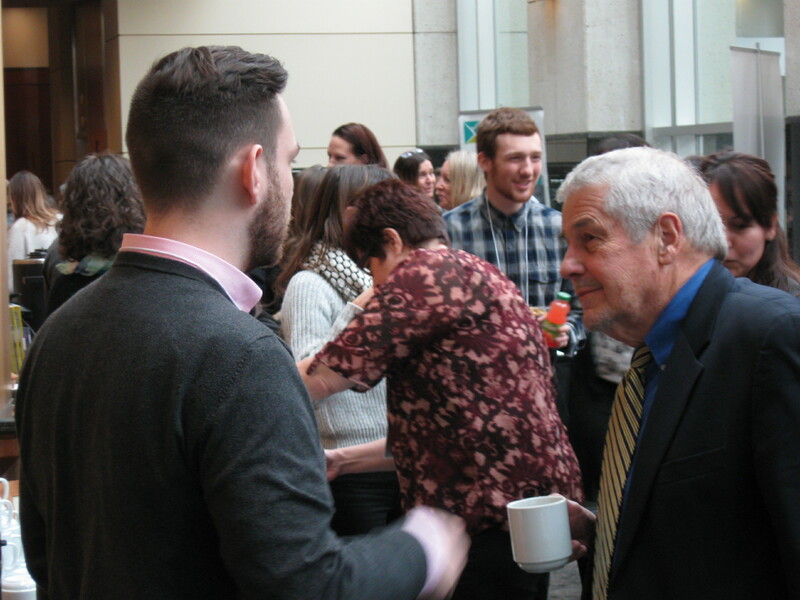 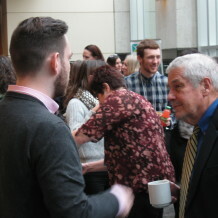 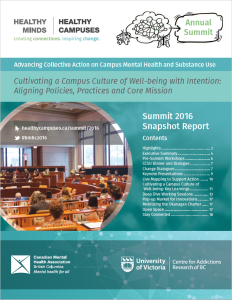 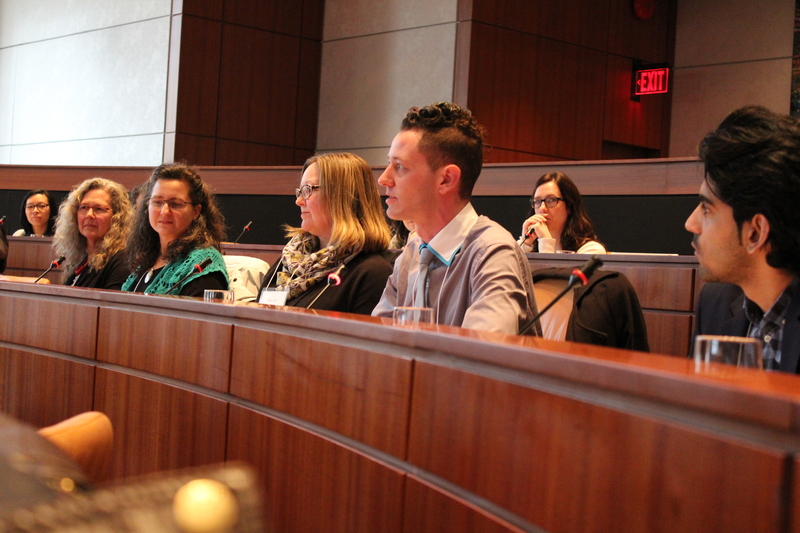 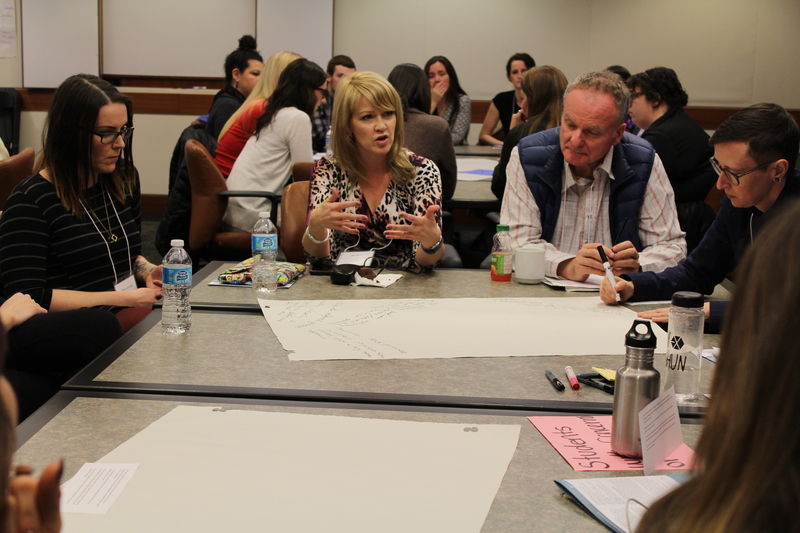 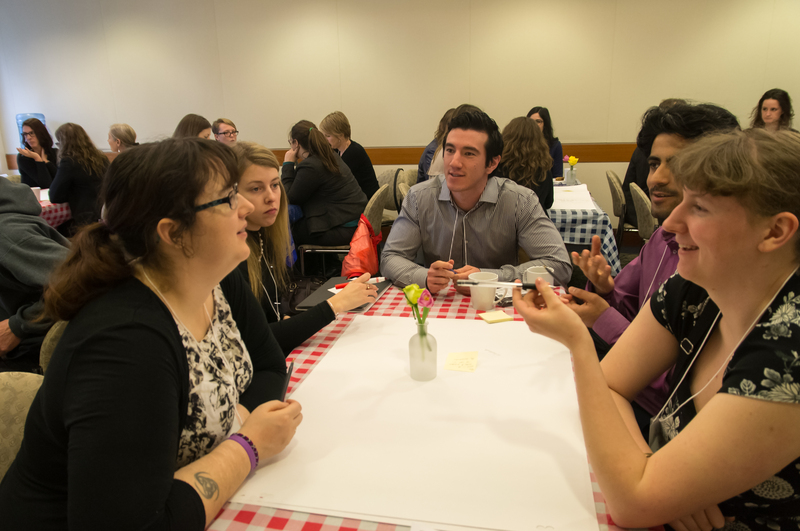 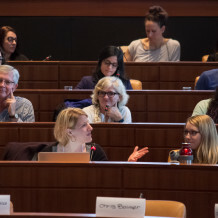 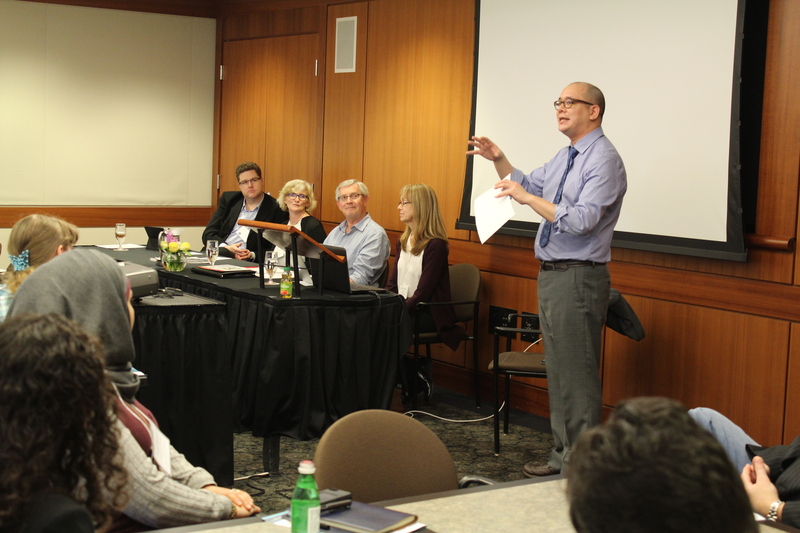 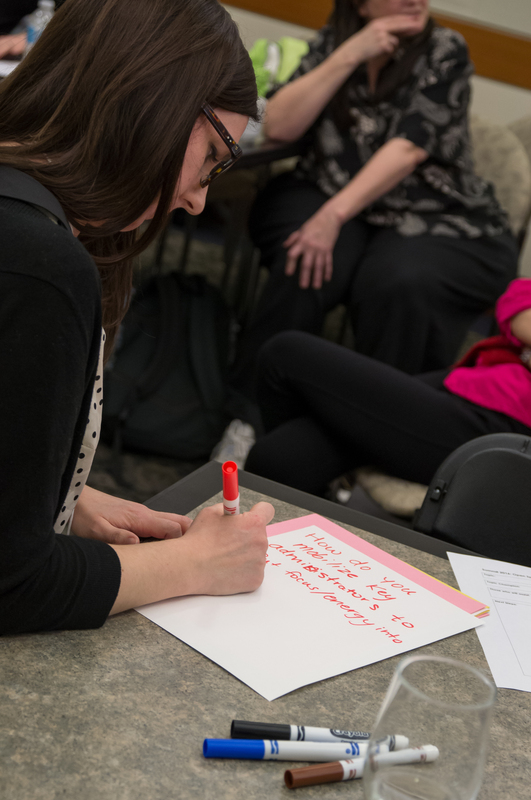 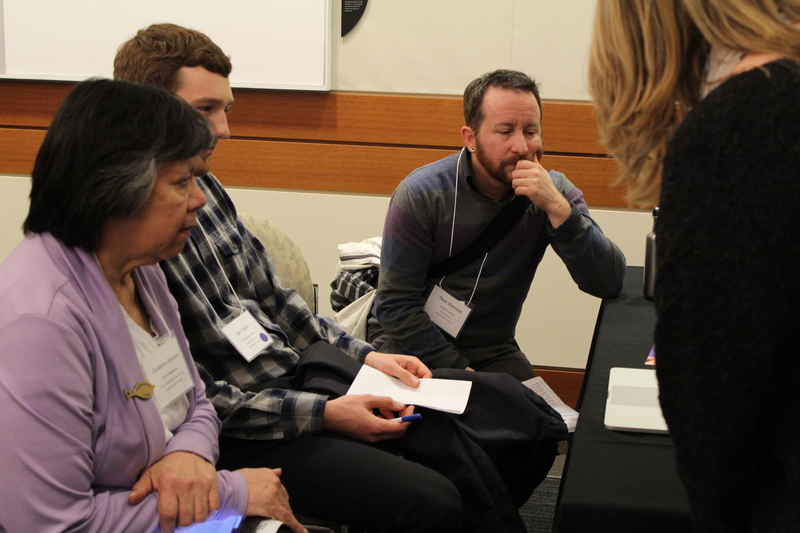 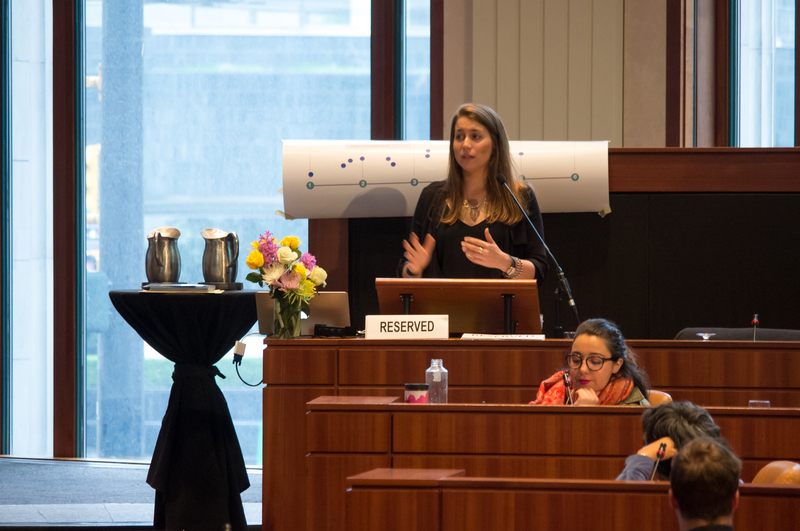 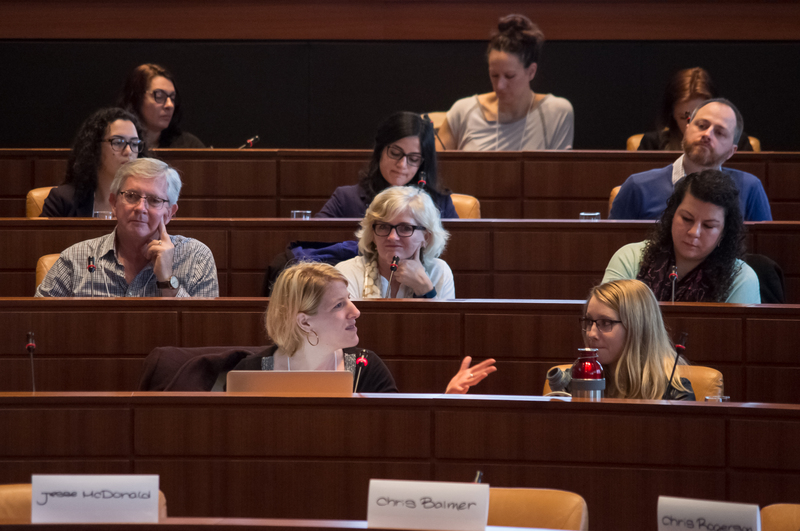 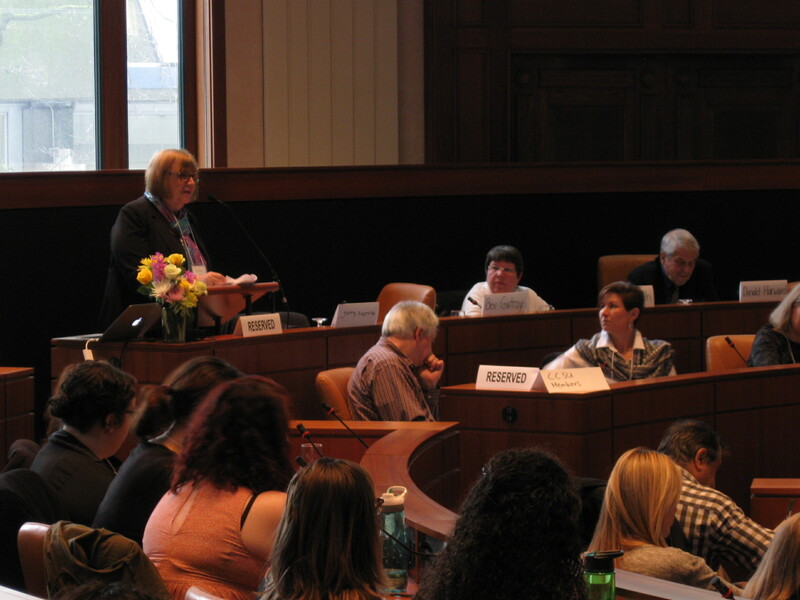 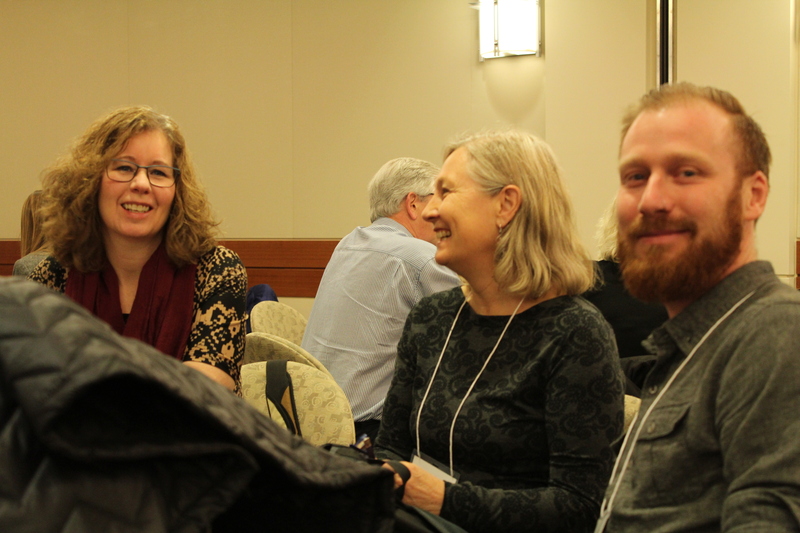 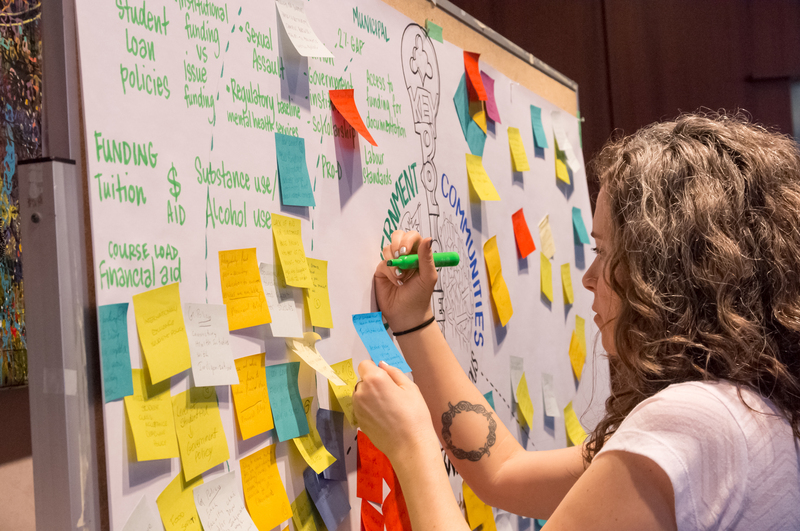 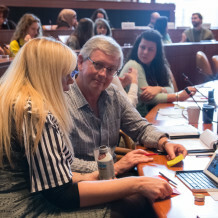 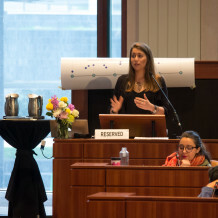 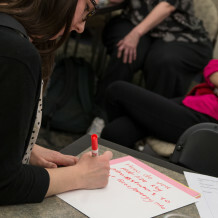 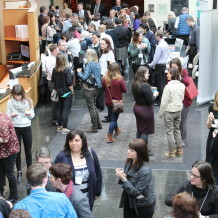 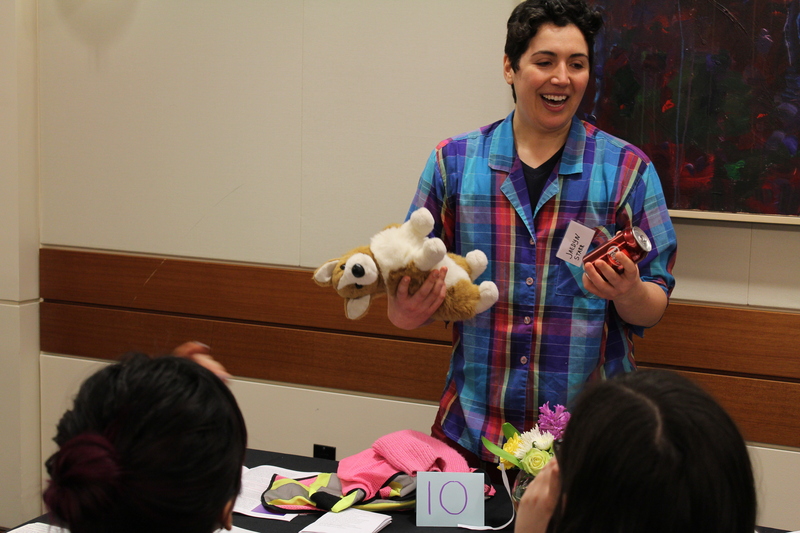 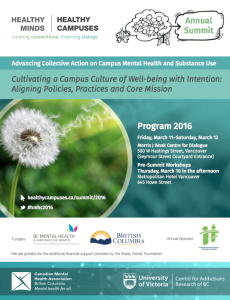 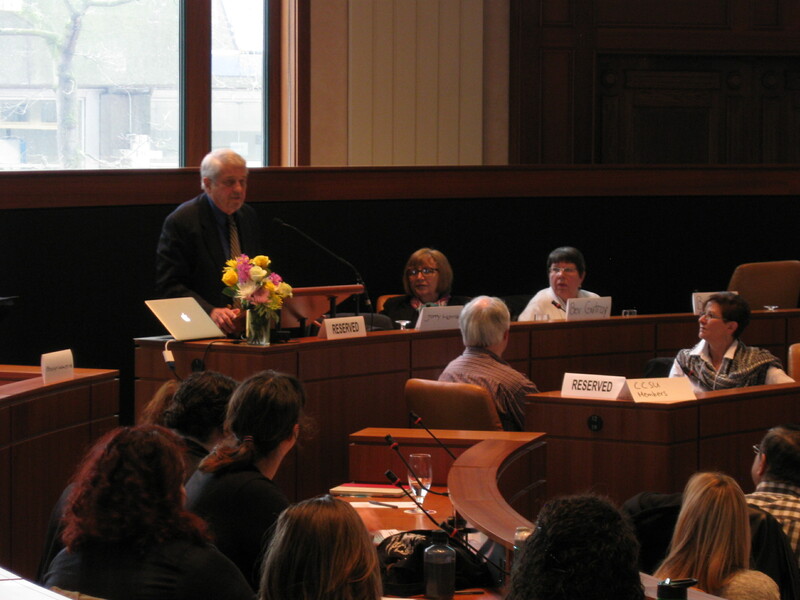 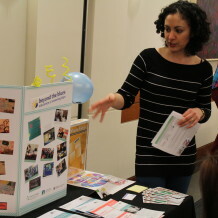 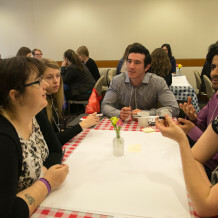 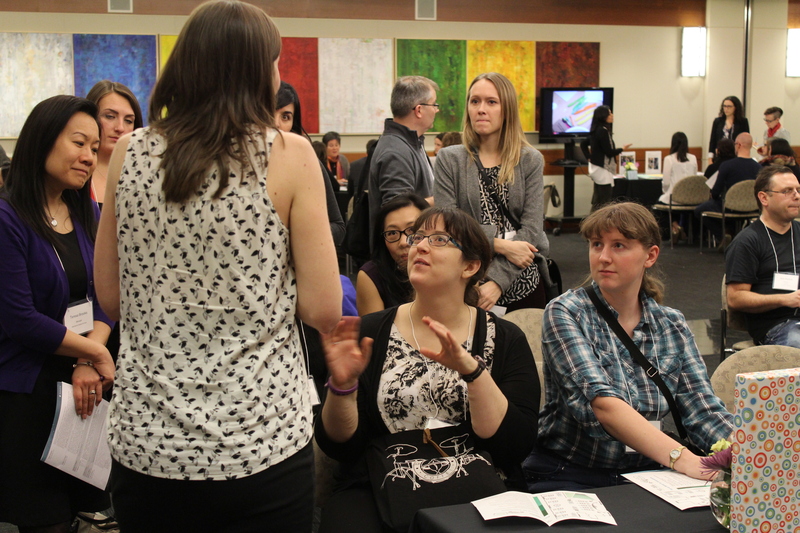 On March 11th and 12th, 2016 campus stakeholders from across British Columbia came together to advance collective action on campus mental health and substance use. 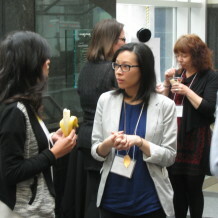 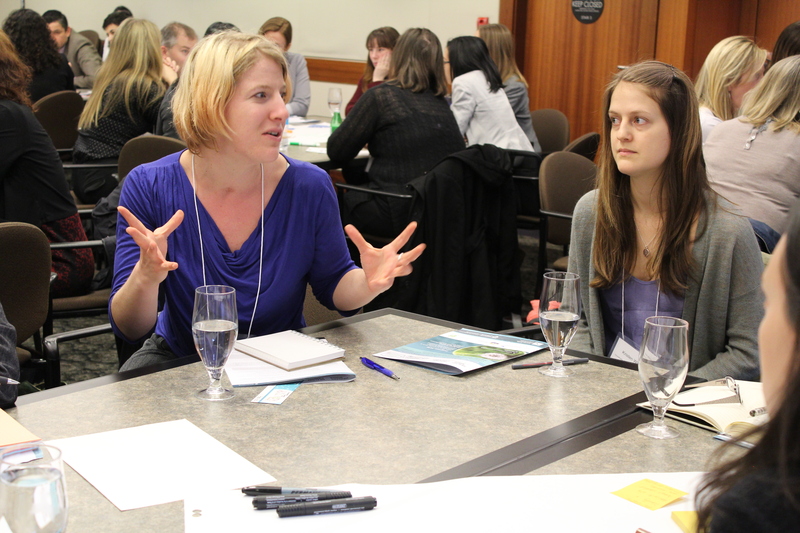 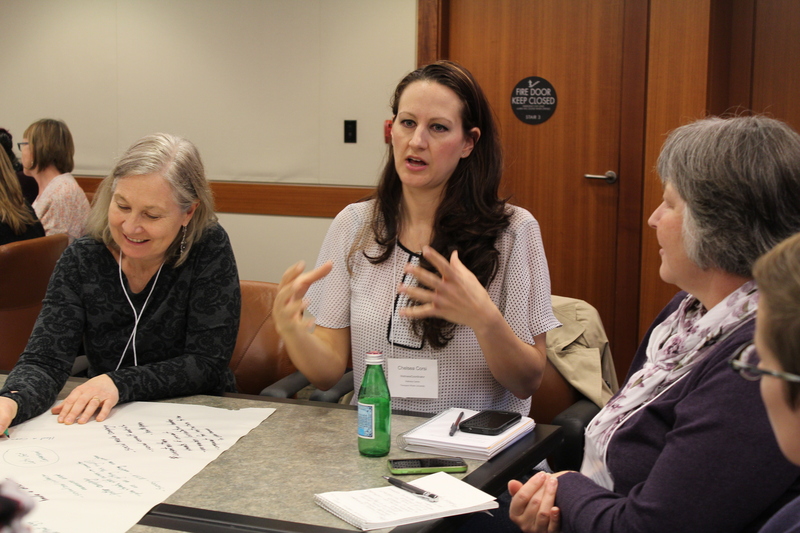 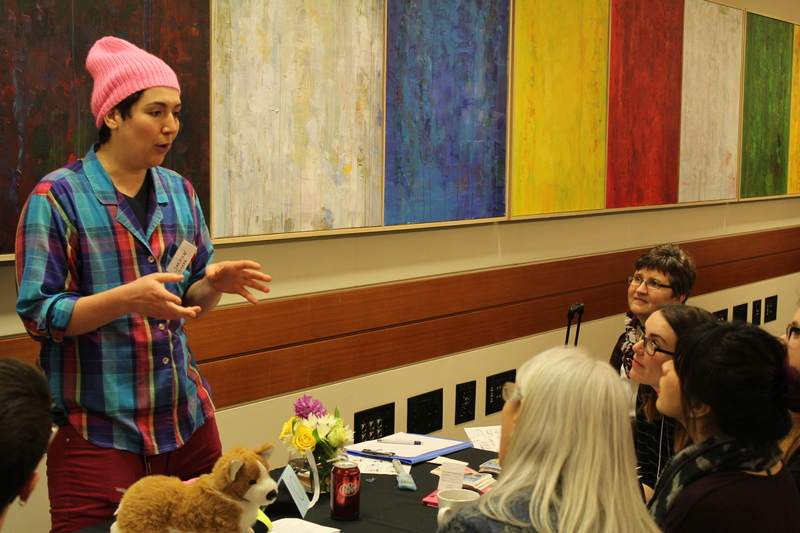 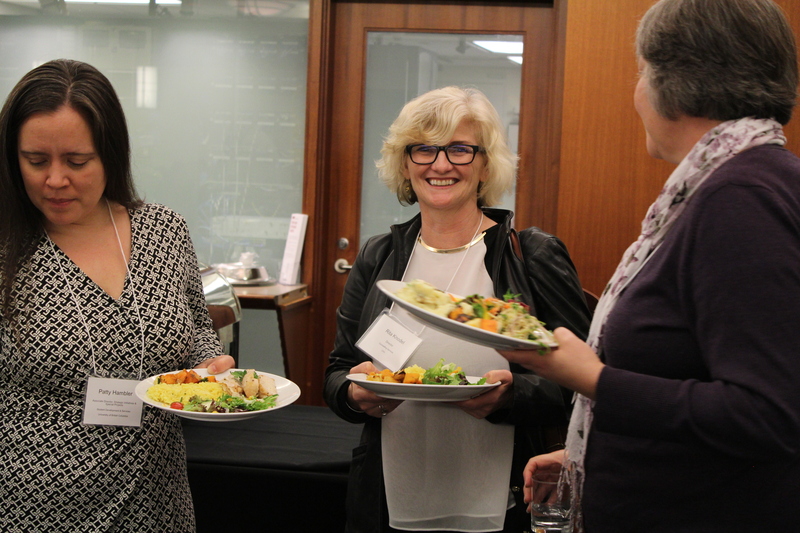 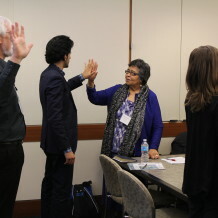 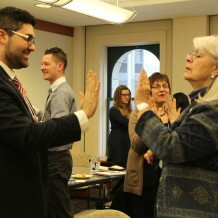 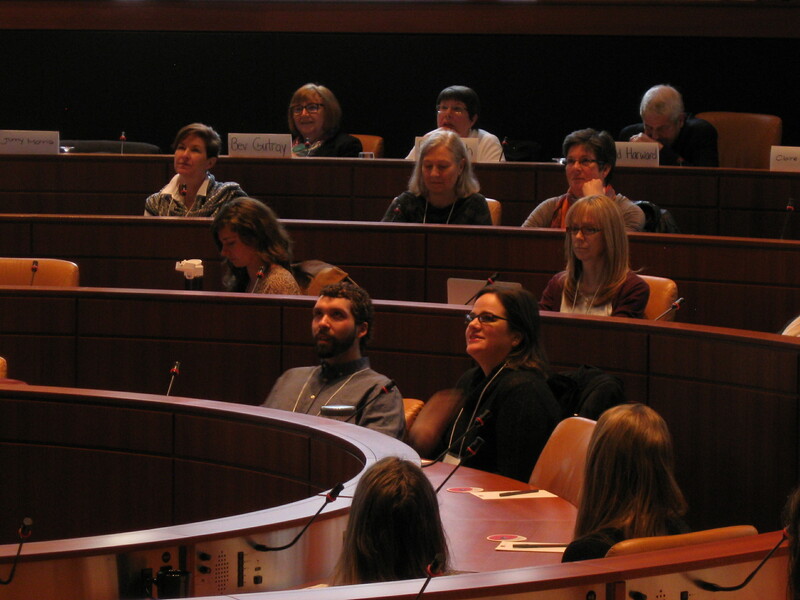 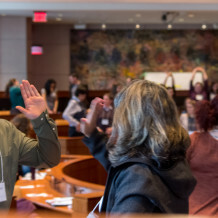 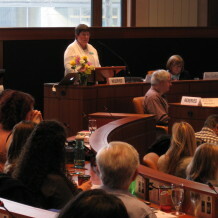 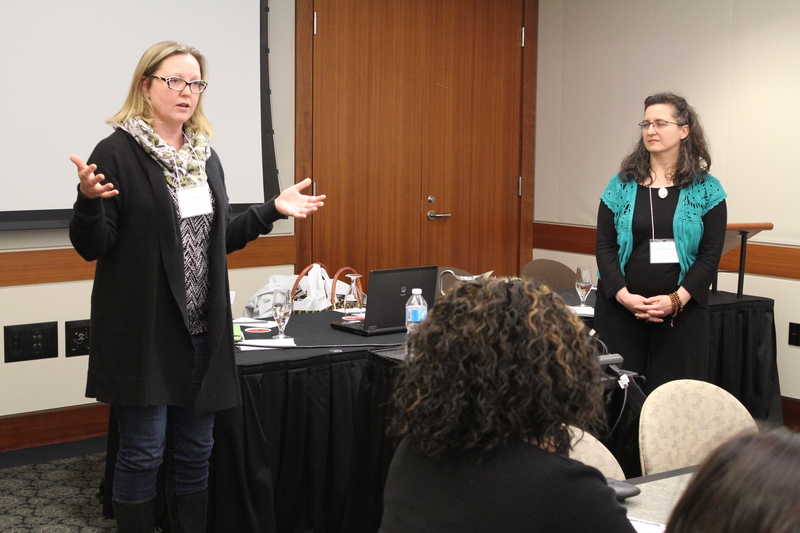 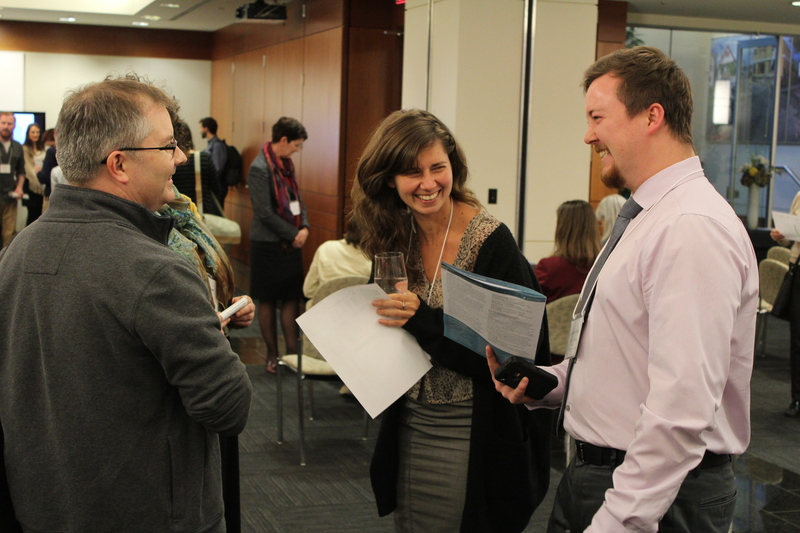 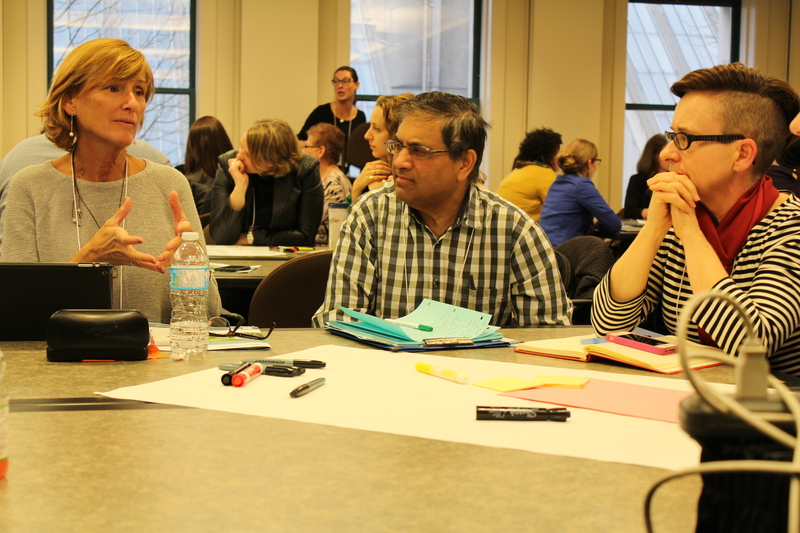 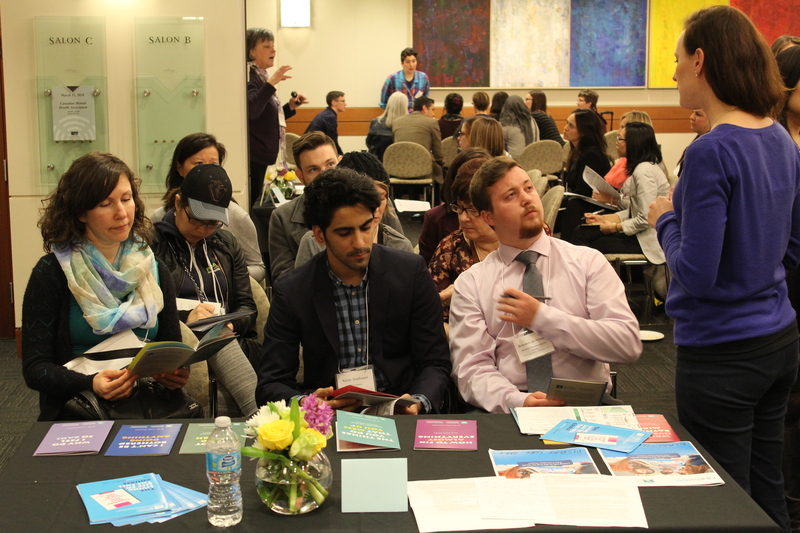 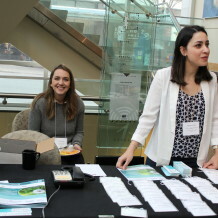 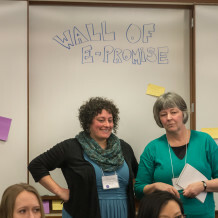 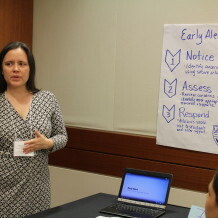 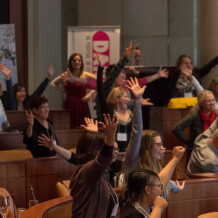 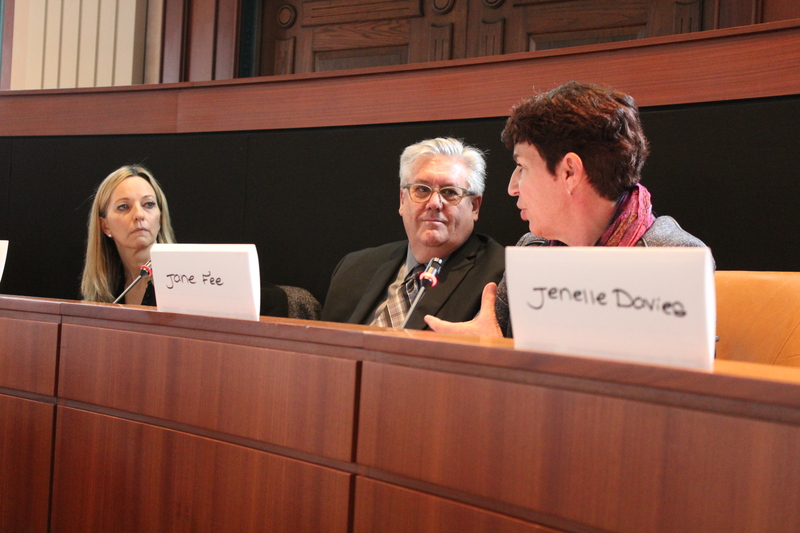 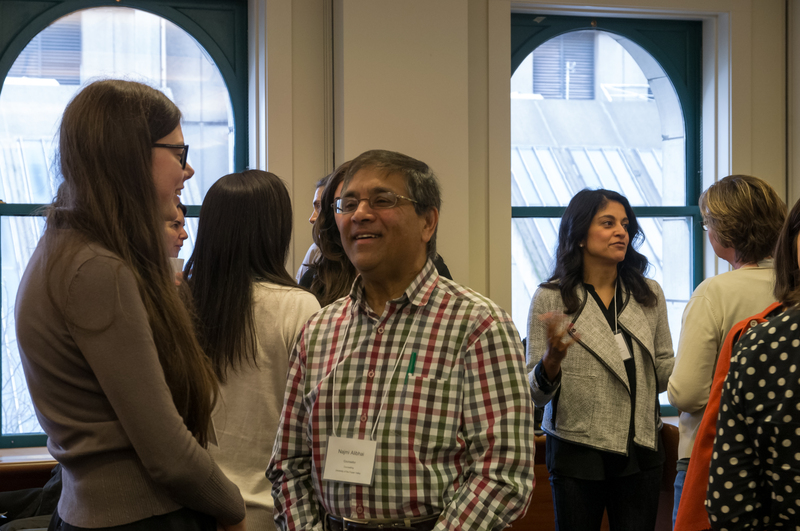 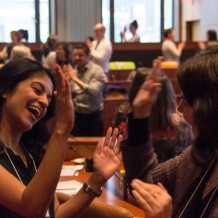 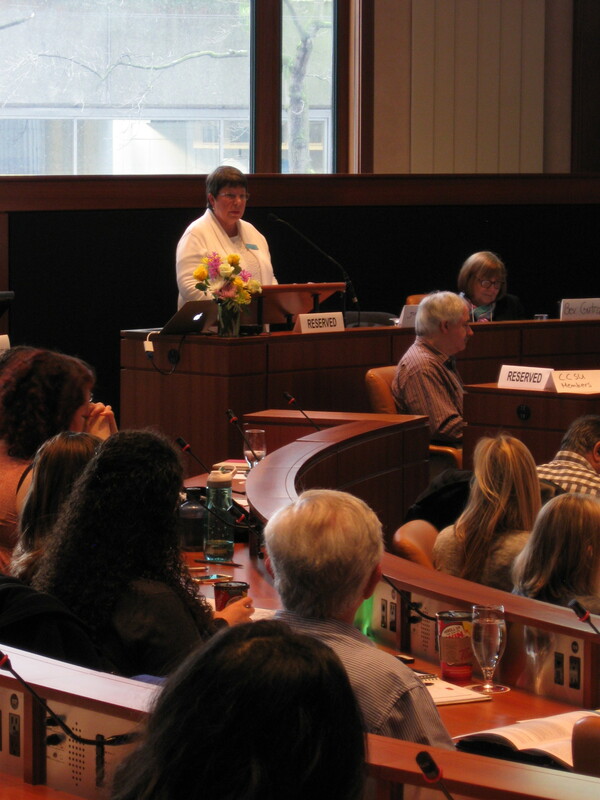 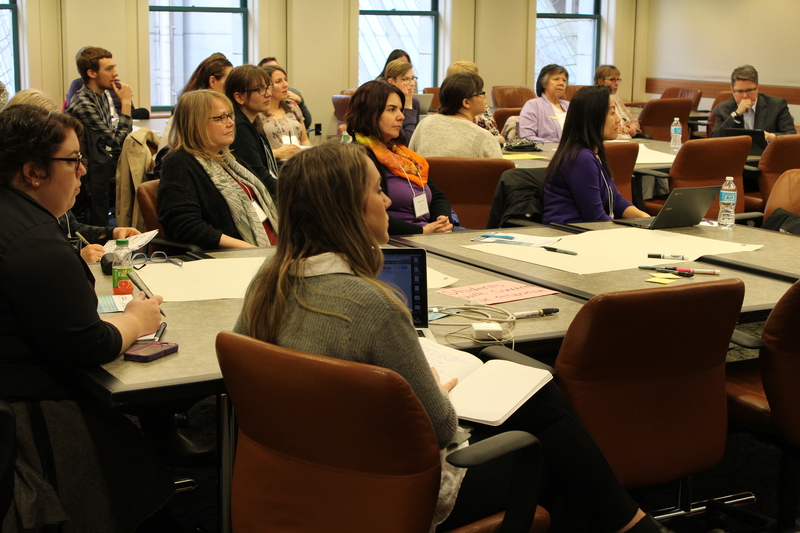 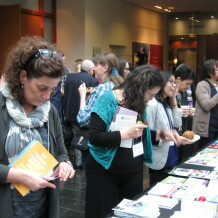 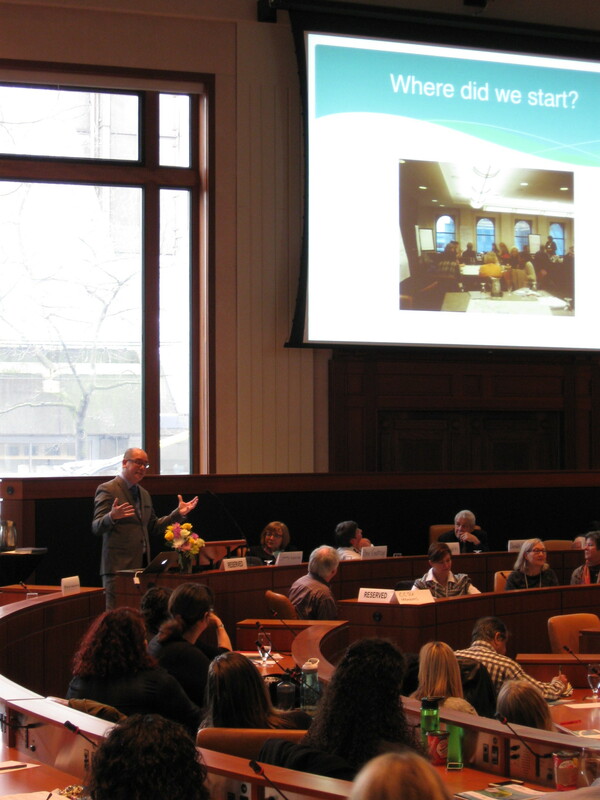 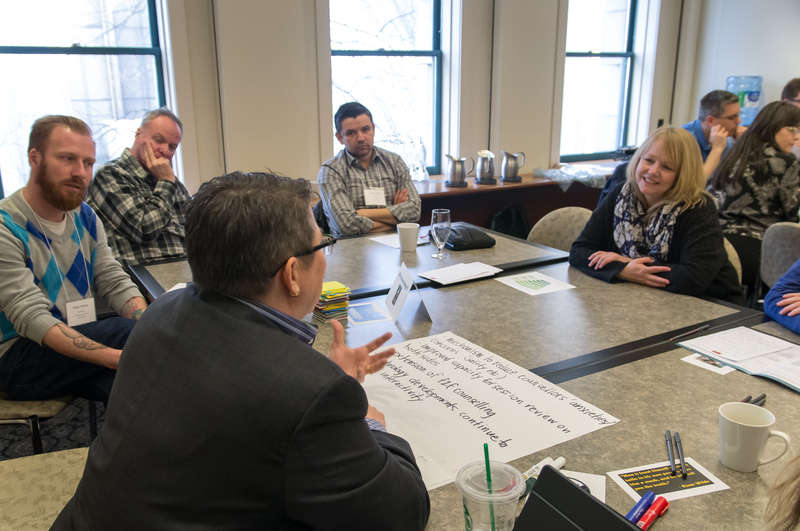 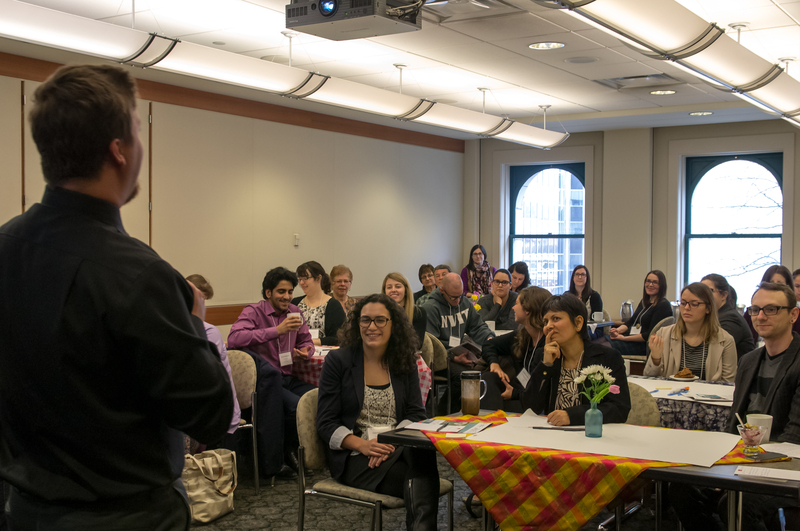 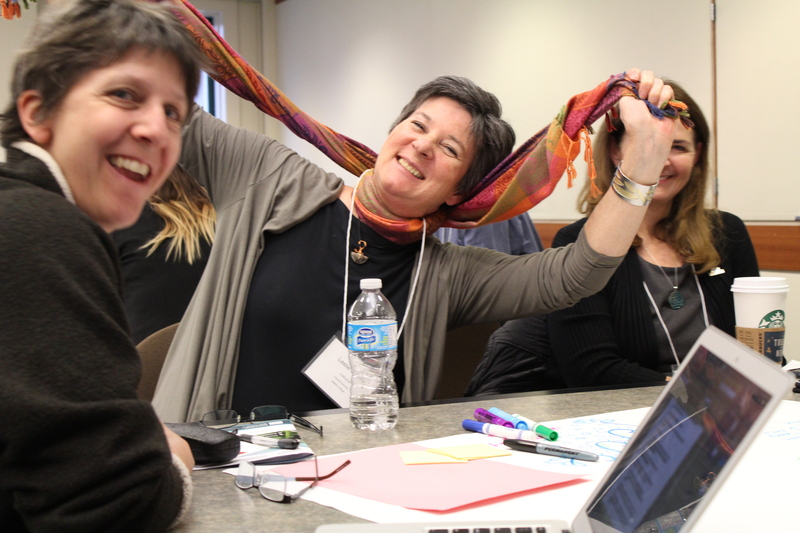 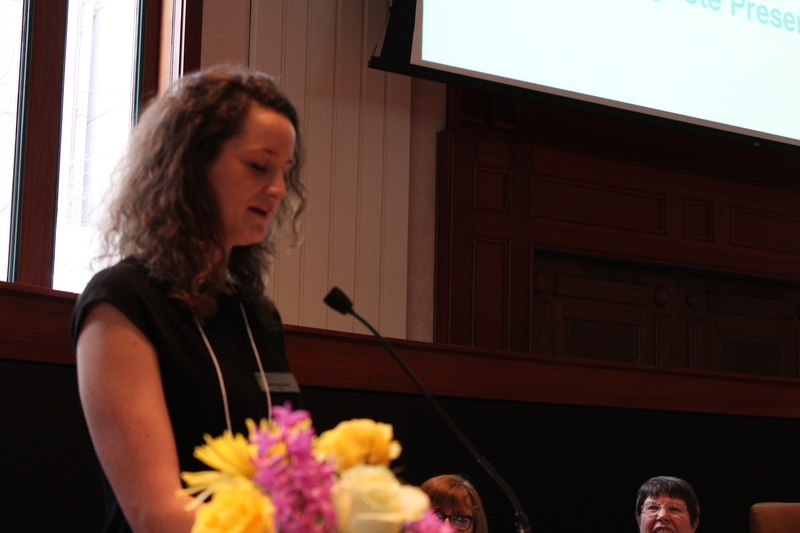 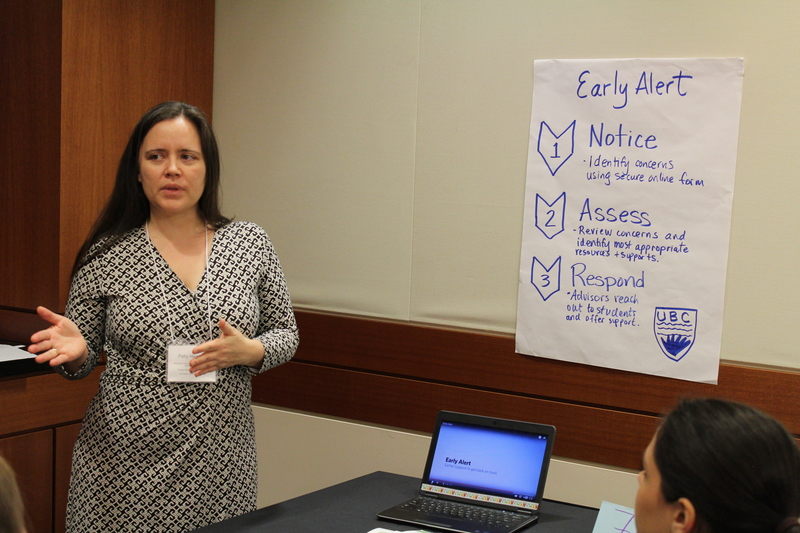 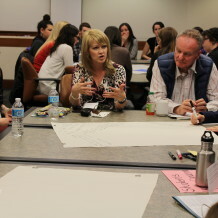 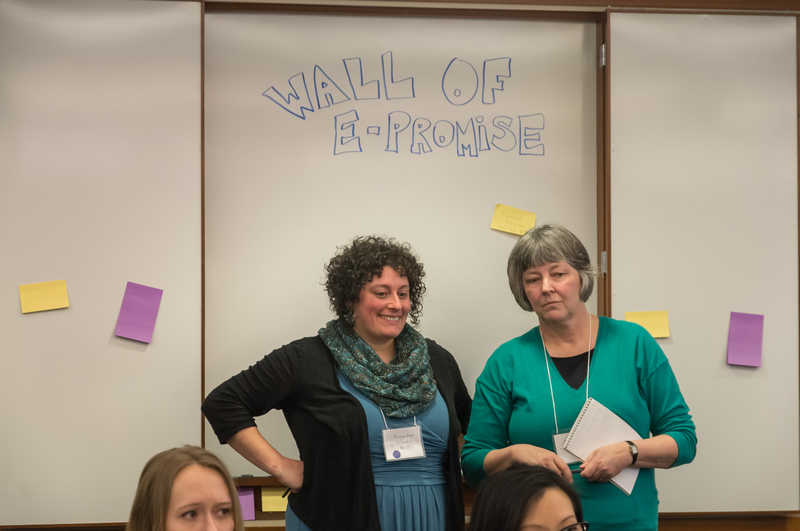 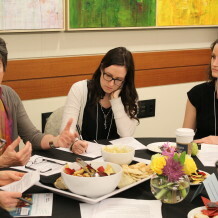 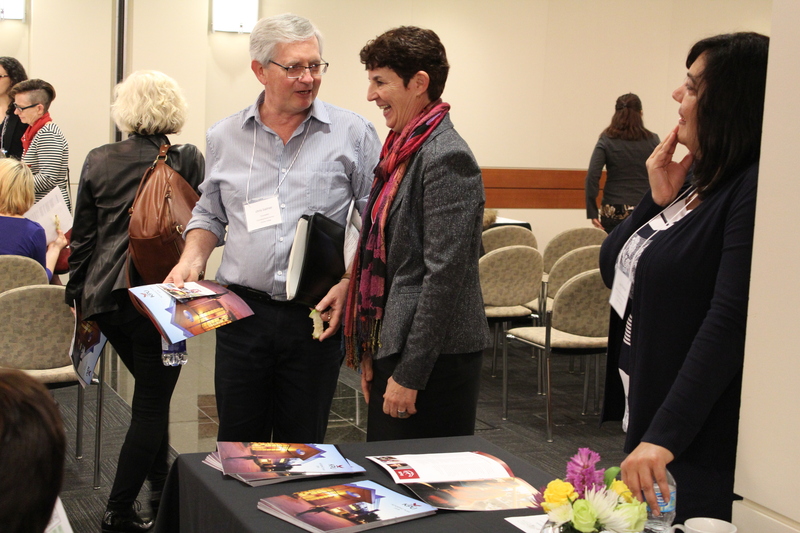 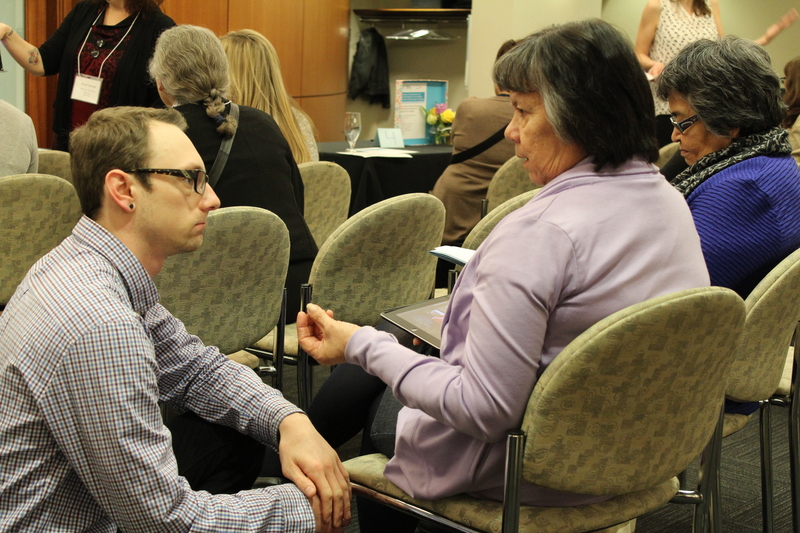 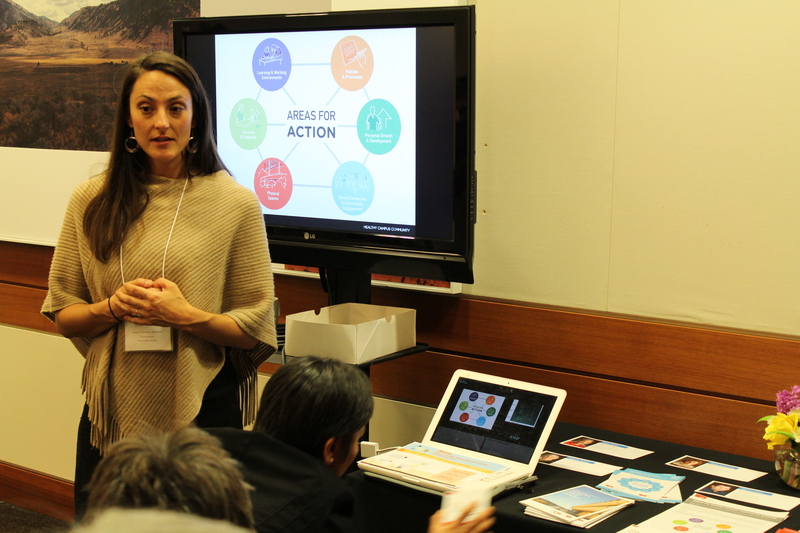 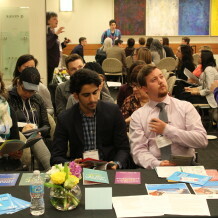 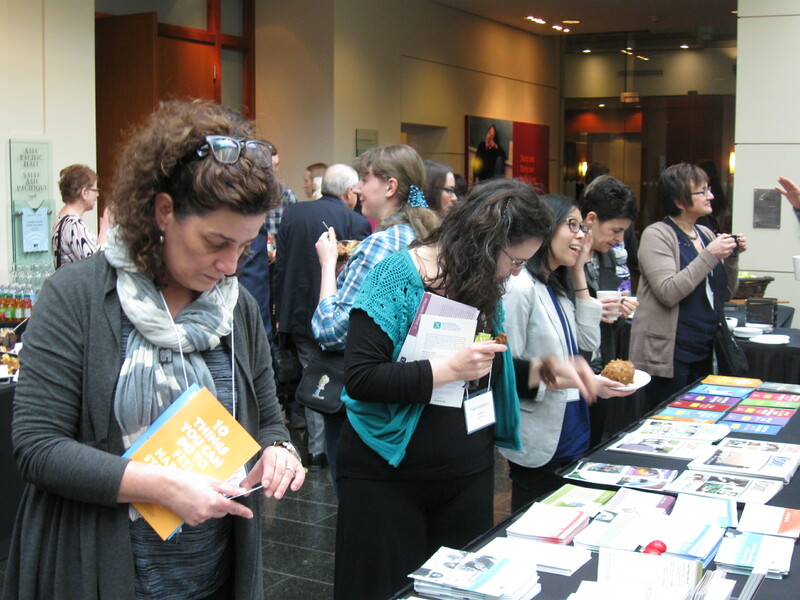 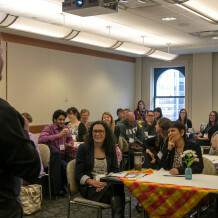 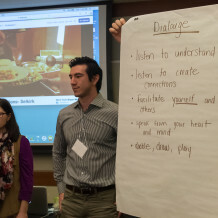 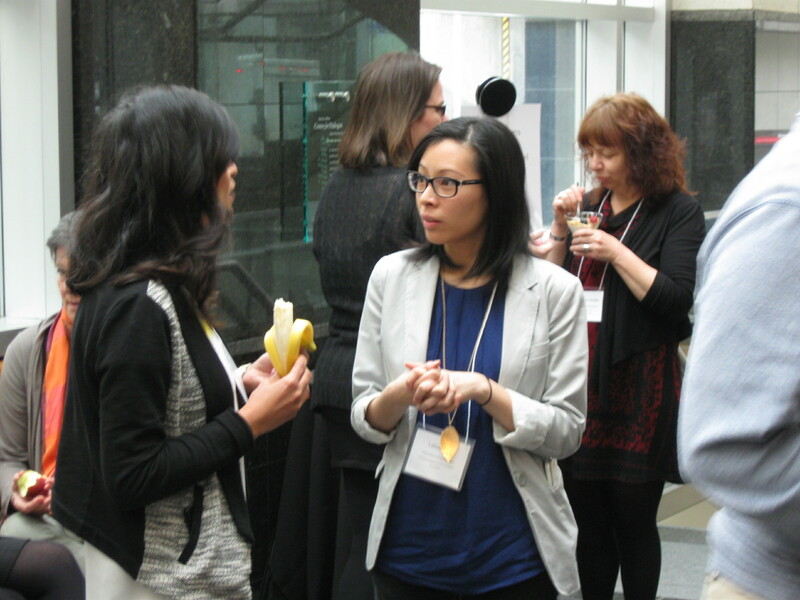 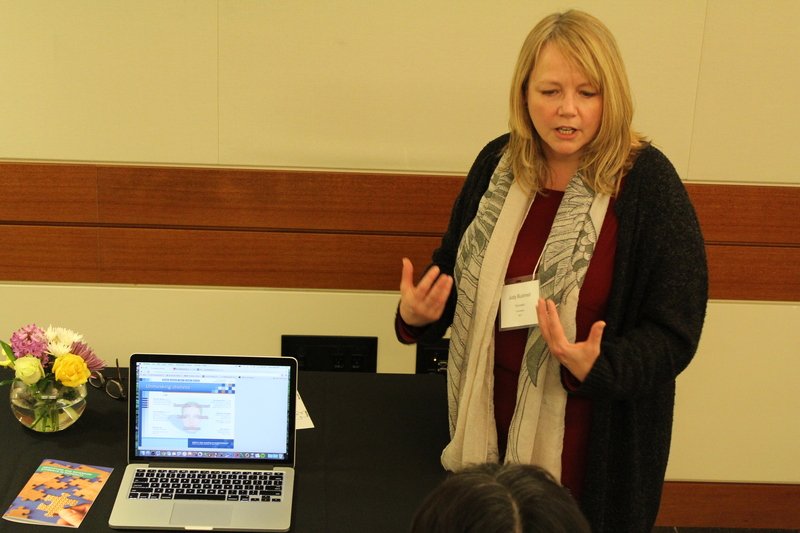 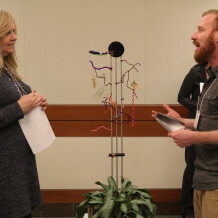 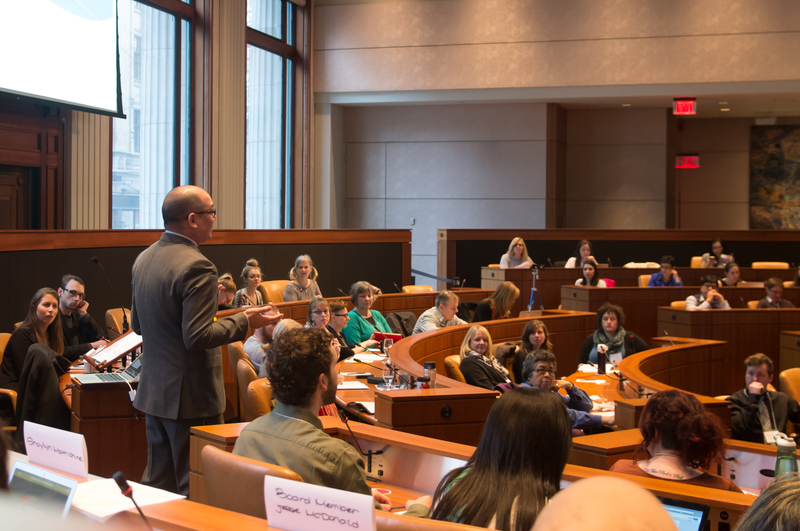 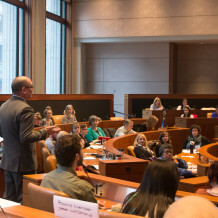 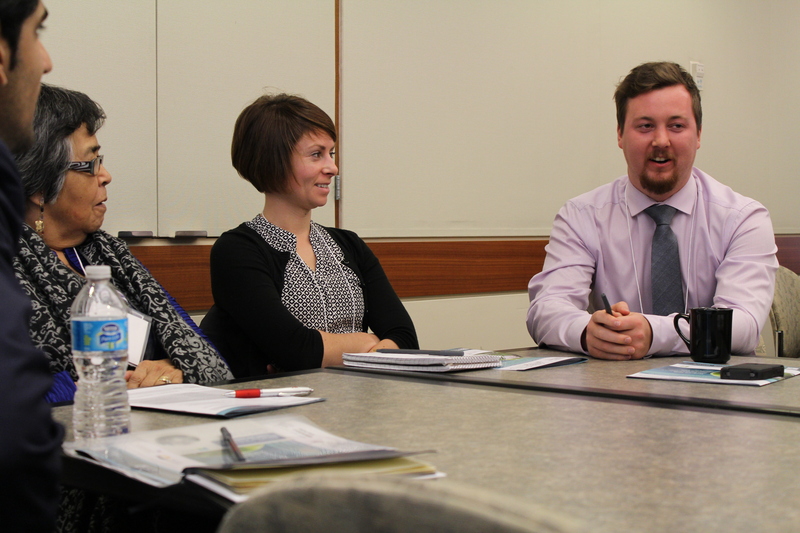 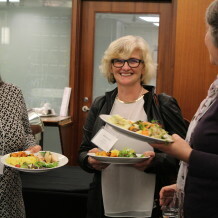 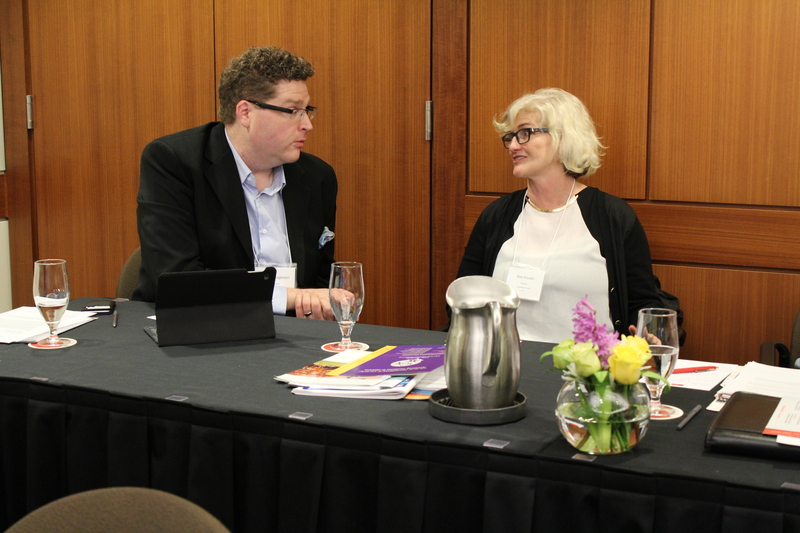 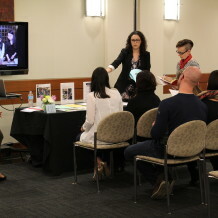 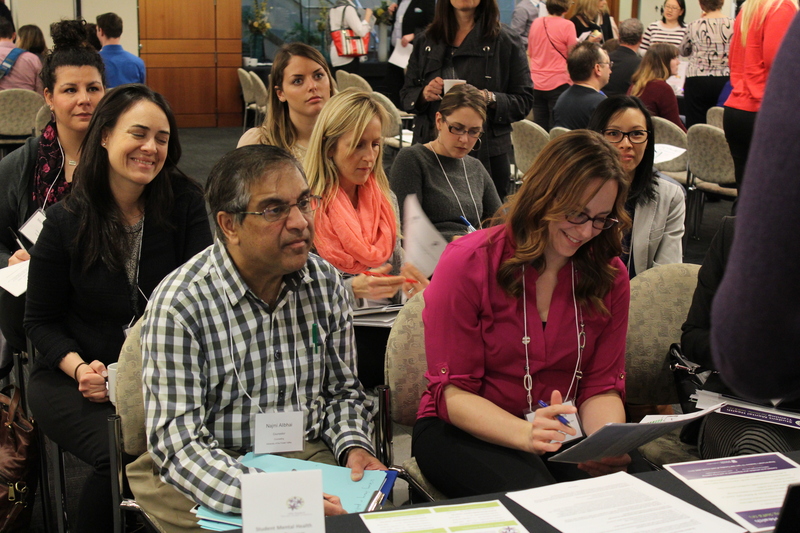 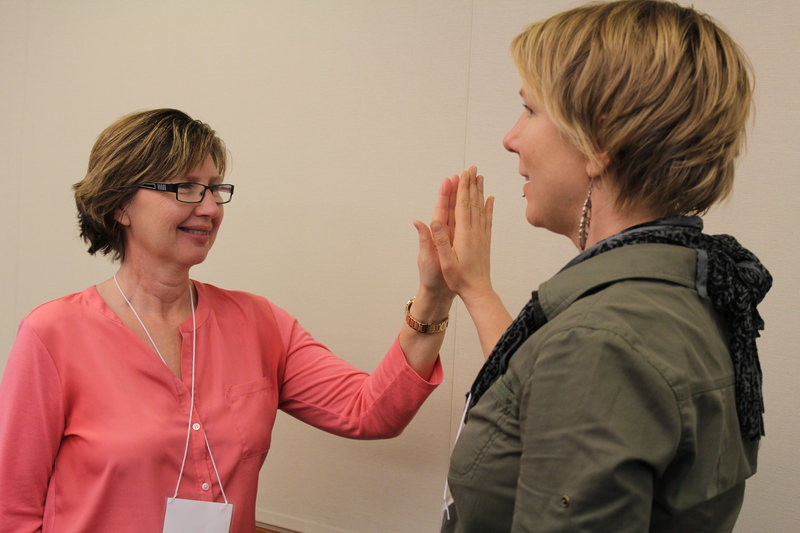 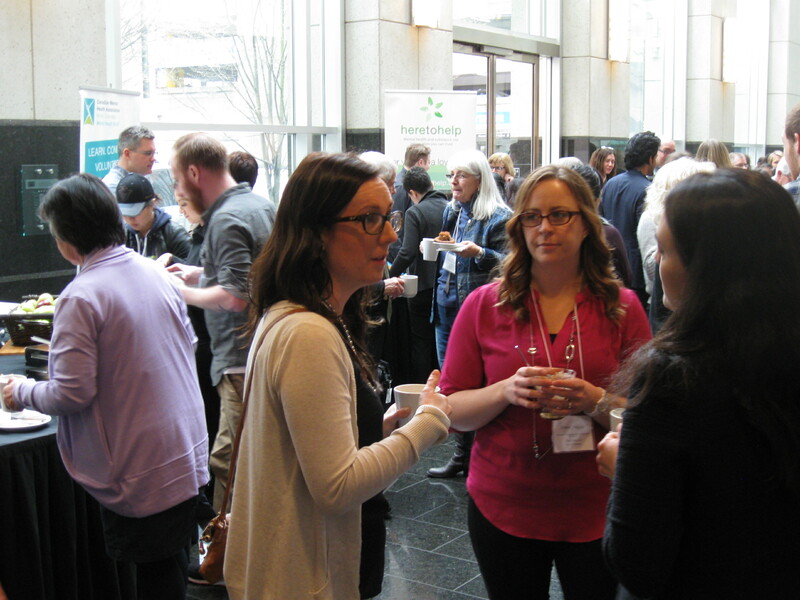 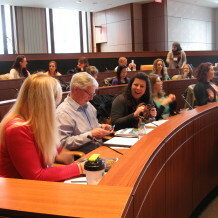 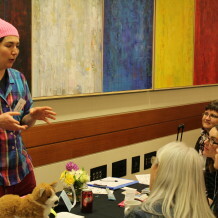 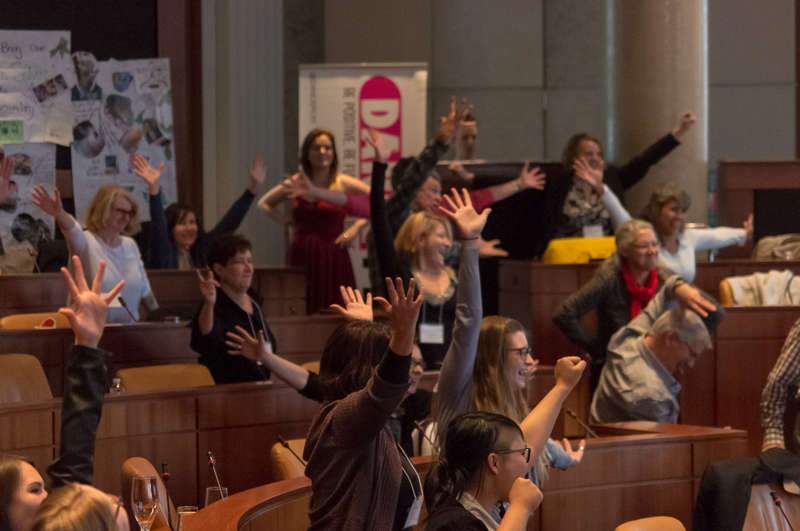 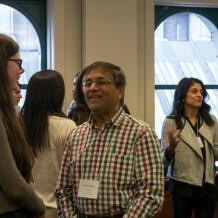 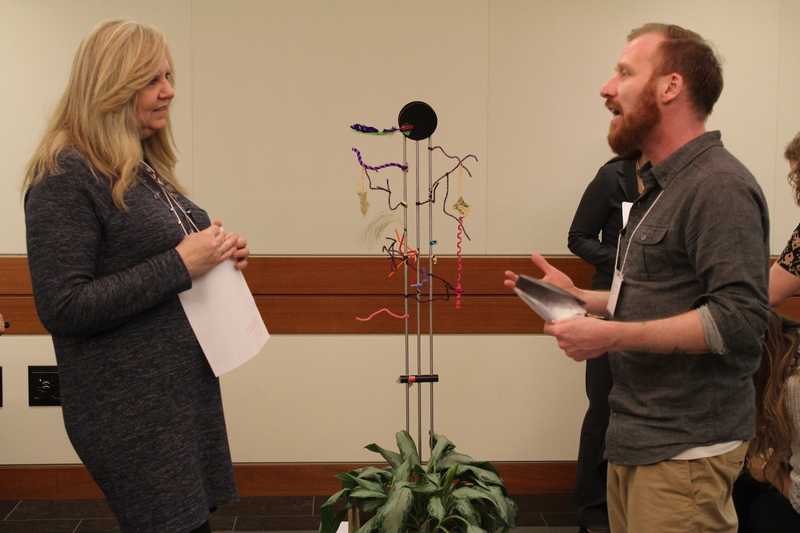 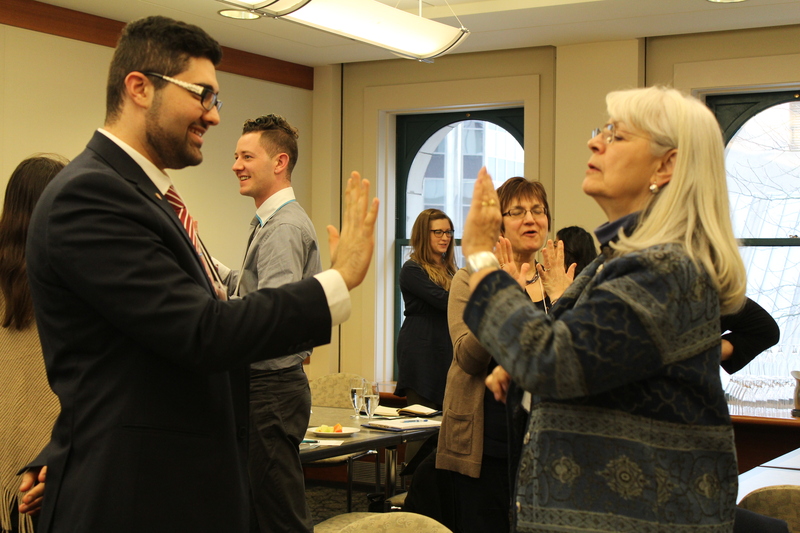 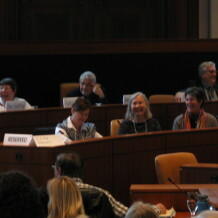 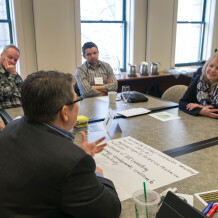 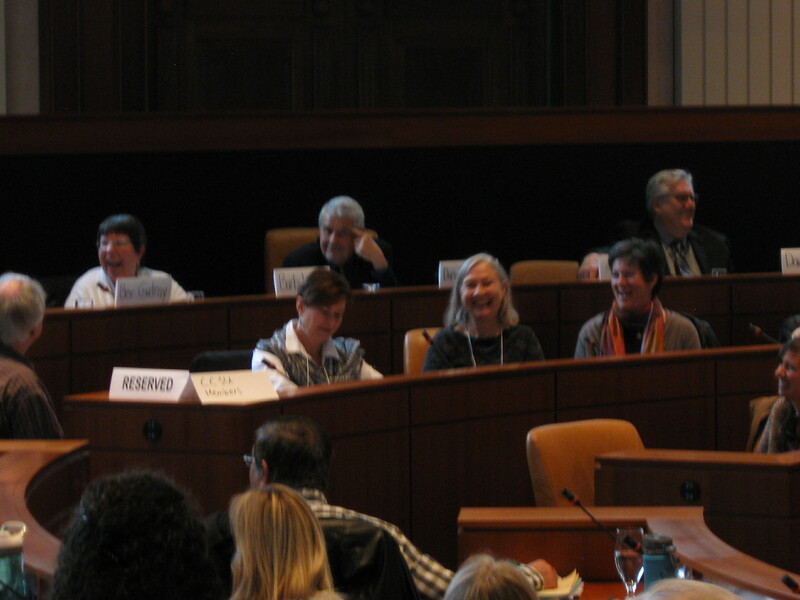 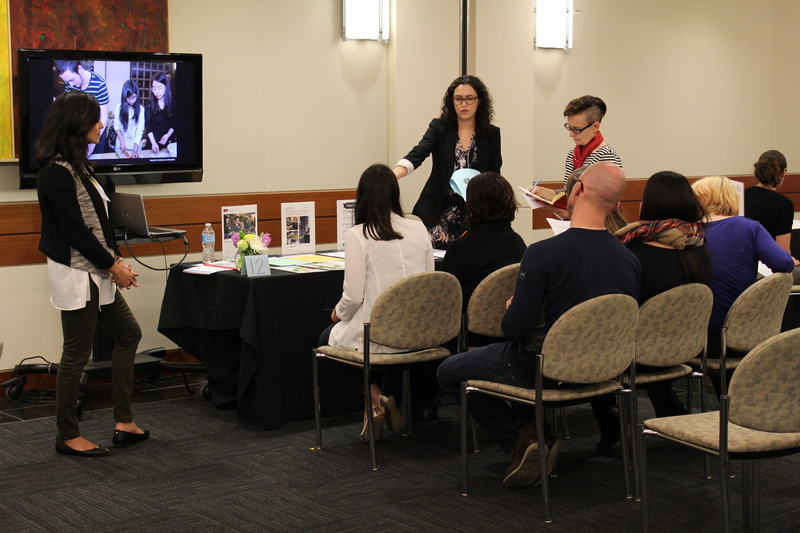 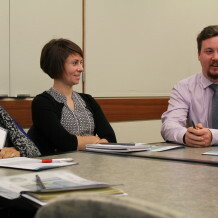 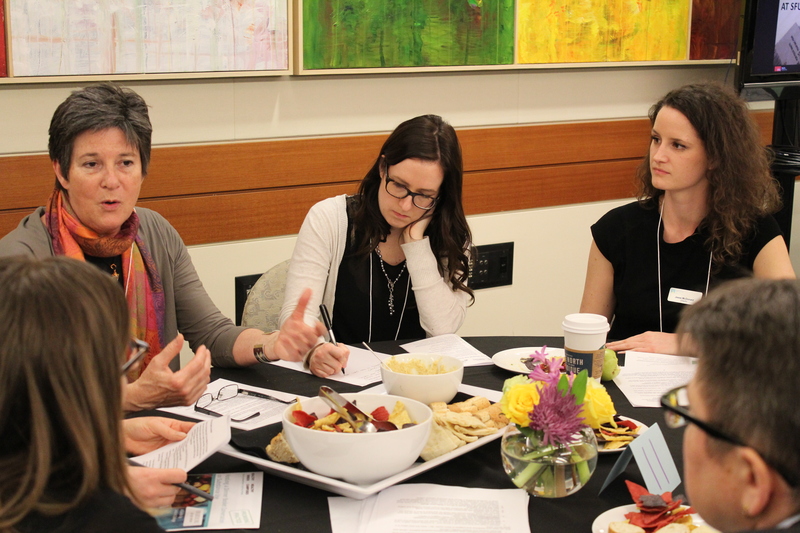 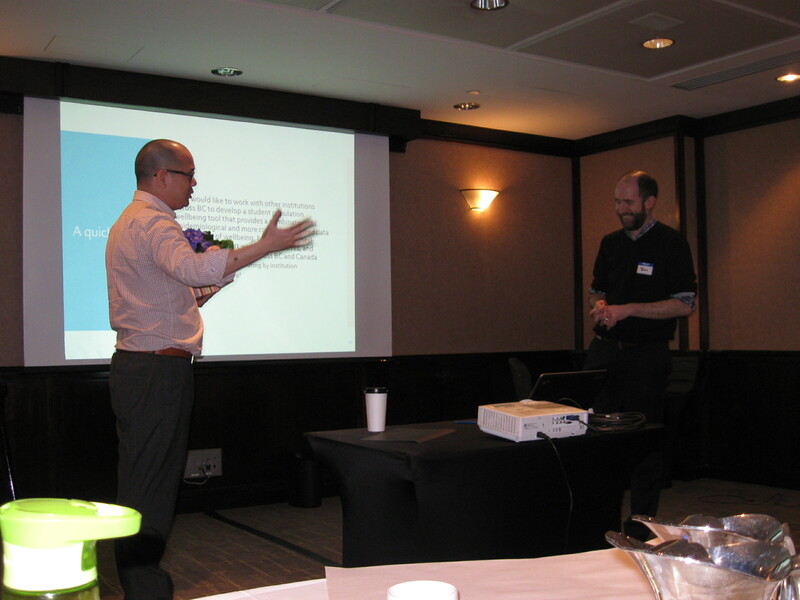 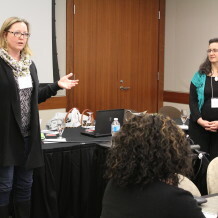 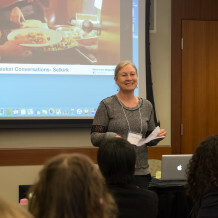 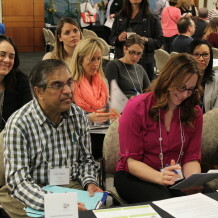 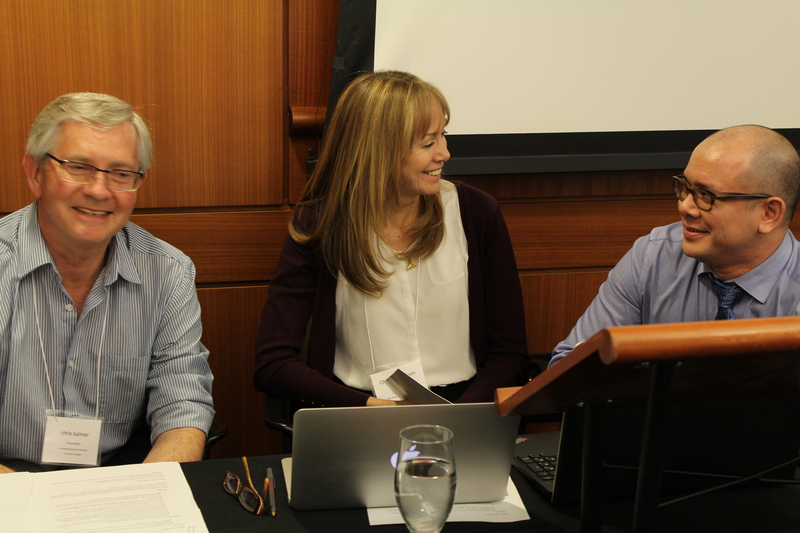 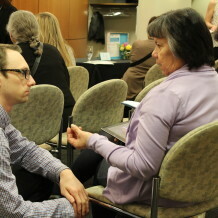 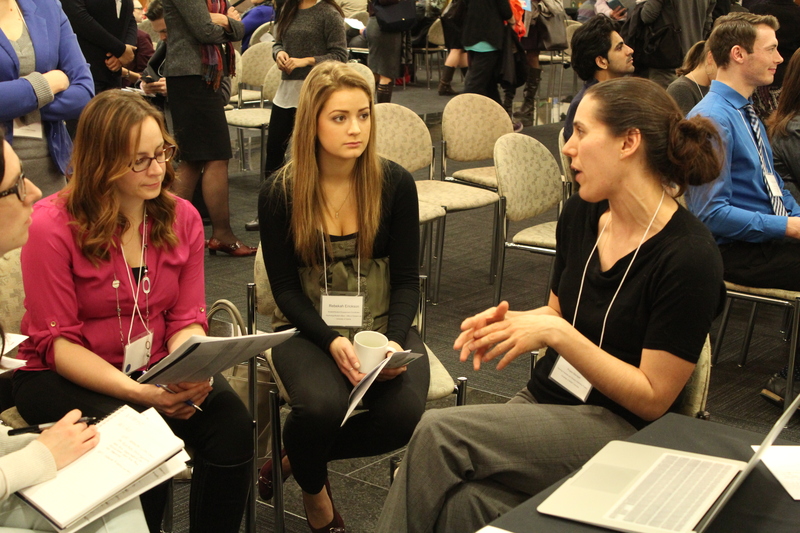 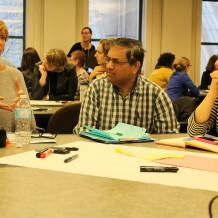 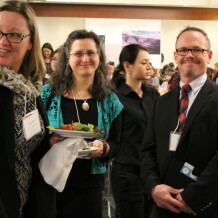 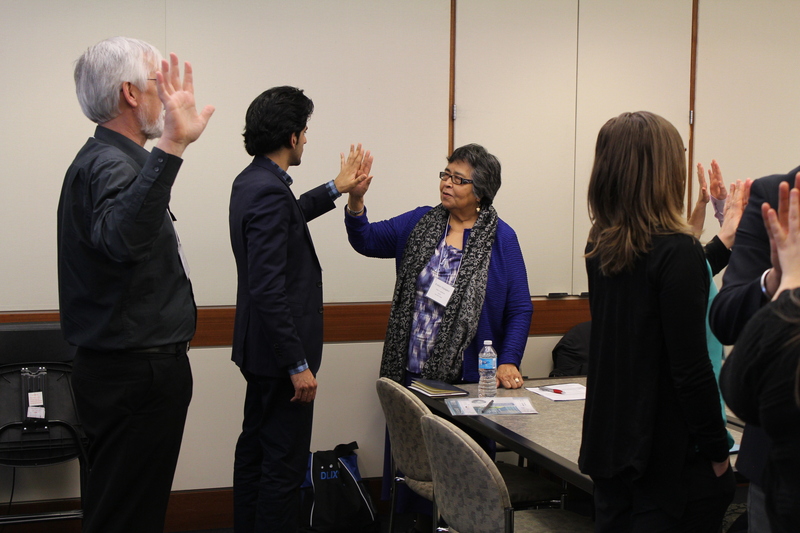 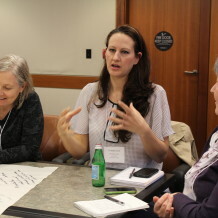 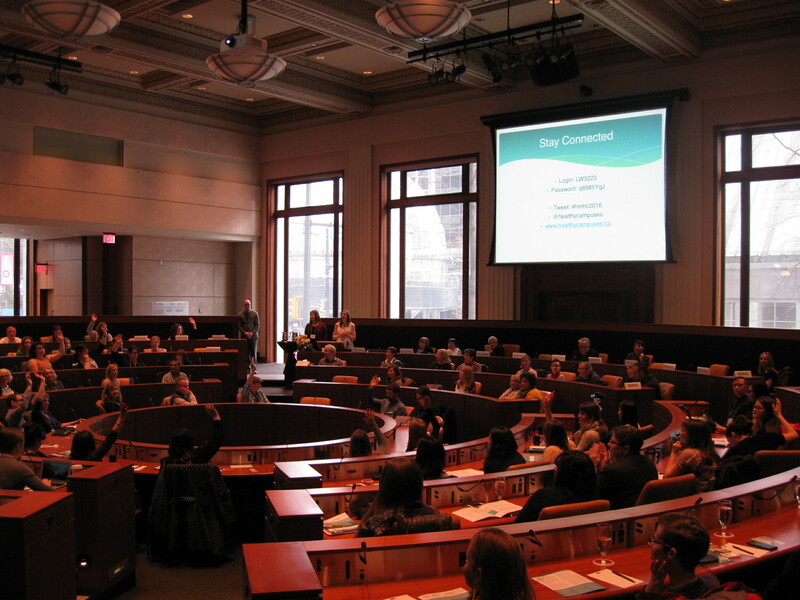 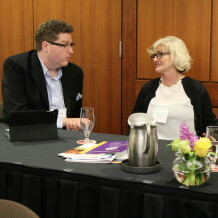 Summit 2016, “Cultivating a Campus Culture of Well-being with Intention: Aligning Policies, Practices and Core Mission” took place at the Morris J Wosk Centre for Dialogue in downtown Vancouver at 580 W Hastings Street. 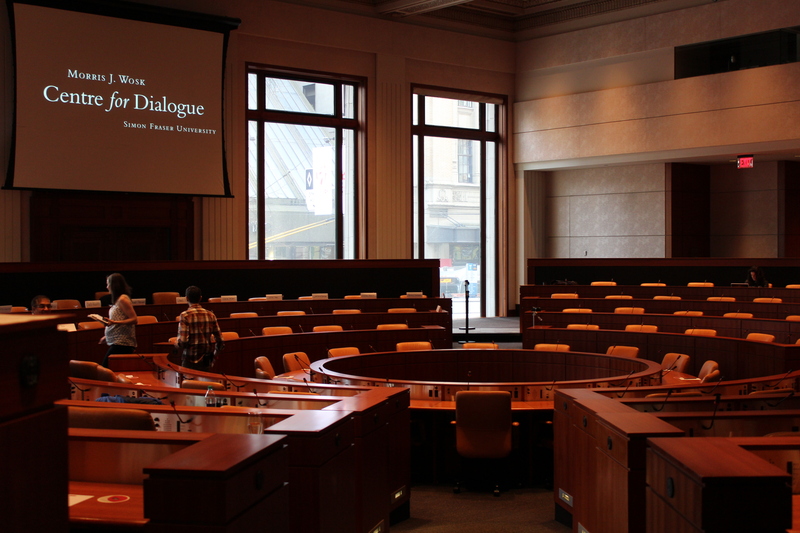 This venue was created to facilitate dialogue and enhance interaction, with the main plenary hall a “UN-style” circular set-up. 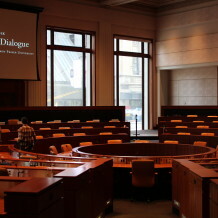 This old bank building has been turned into a unique meeting space with stunning architecture, natural light and state-of-the-art technology. 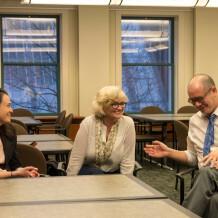 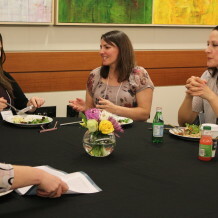 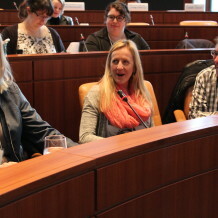 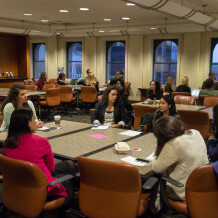 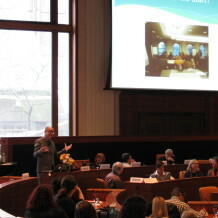 This venue provided a space to stimulate meaningful discussion and share ideas. 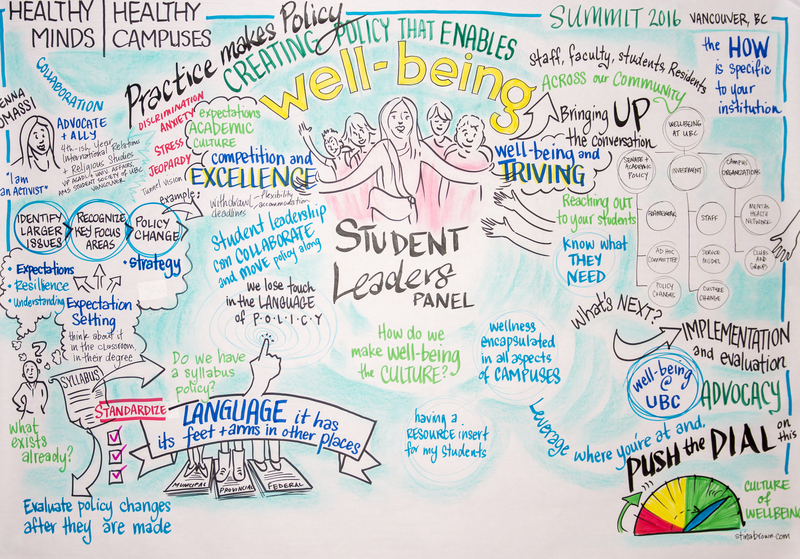 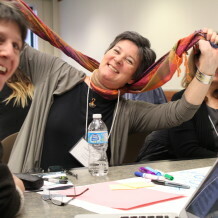 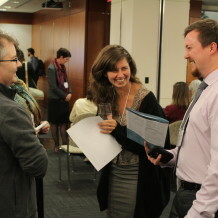 View a Storify summary of the tweets shared throughout the Summit here. 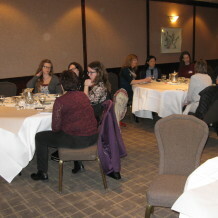 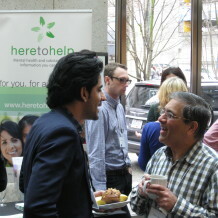 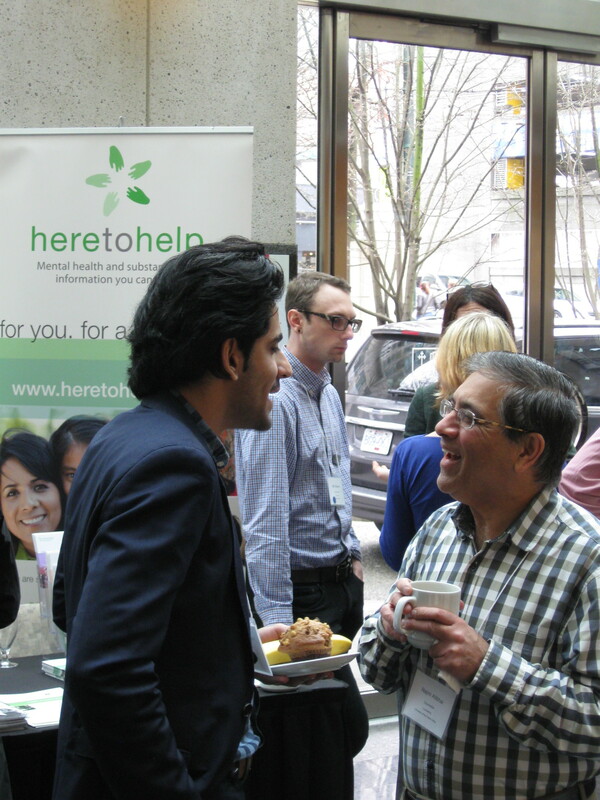 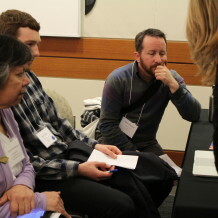 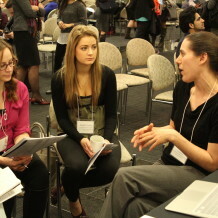 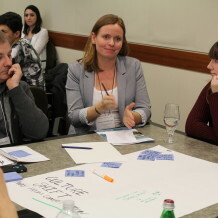 Pre-Summit workshops took place on Thursday, March 10, from 1:00pm – 5pm at The Metropolitan Hotel. 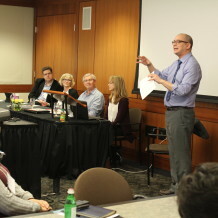 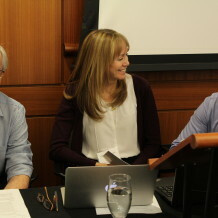 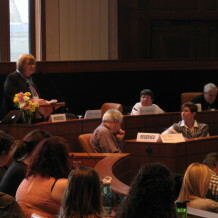 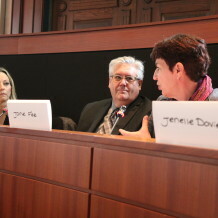 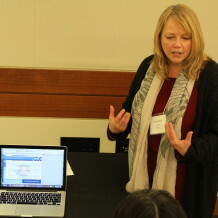 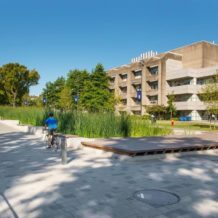 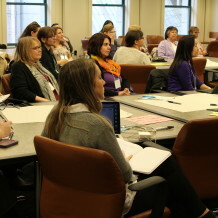 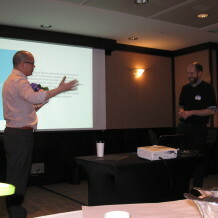 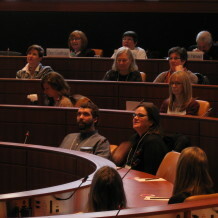 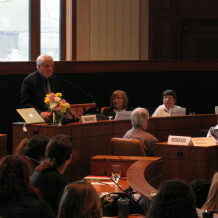 Two workshops ran concurrently, including: “Implementing the National Standard for Psychological Health and Safety in the Workplace: Applying a Whole Campus Approach for All” and “Evaluation of Settings and Whole Systems Approaches.” The first workshop concretely explored the National Standard and the 13 factors specifically within the unique context of post-secondary institutions. 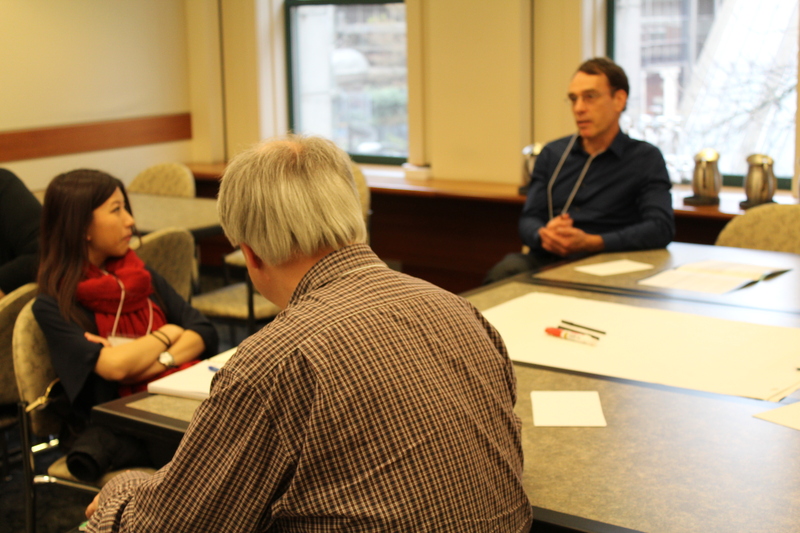 The second workshop engaged participants in addressing the question – how do you know that your campus initiatives are making a difference? 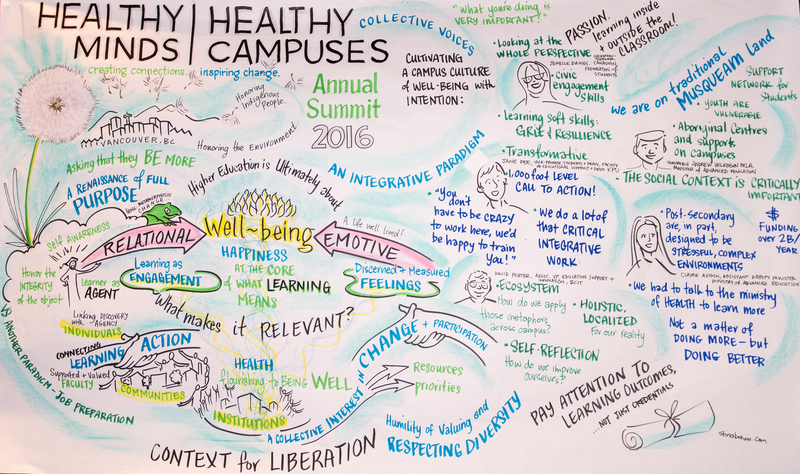 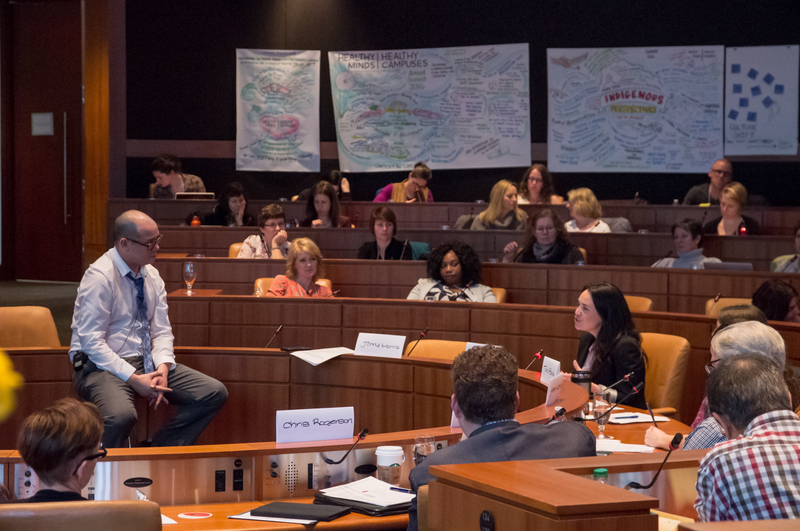 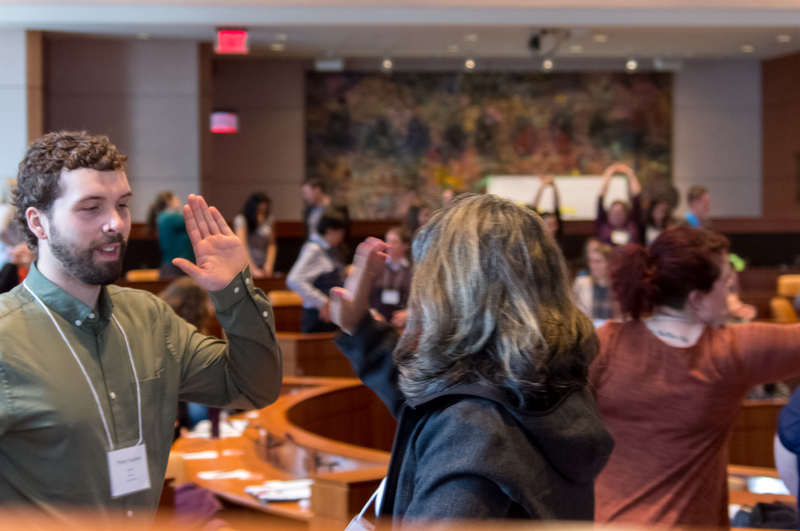 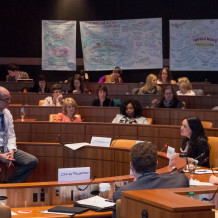 During plenary sessions, participants heard from innovative thought leaders and change makers who are advancing a vision of mentally healthy campus communities. 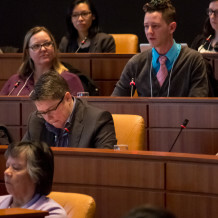 Plenary sessions identified current challenges and practical solutions through panel discussions with senior administrators and student leaders, as well as action-oriented keynote speakers. 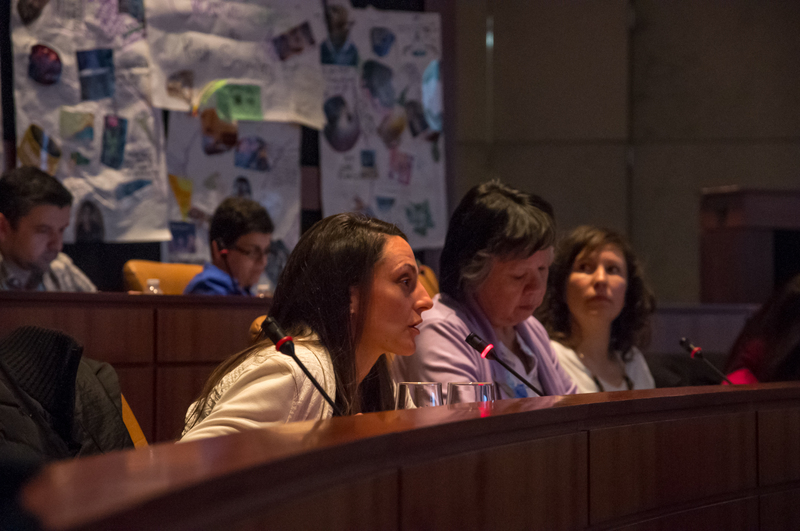 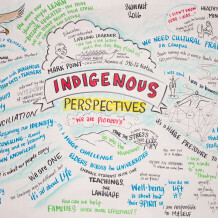 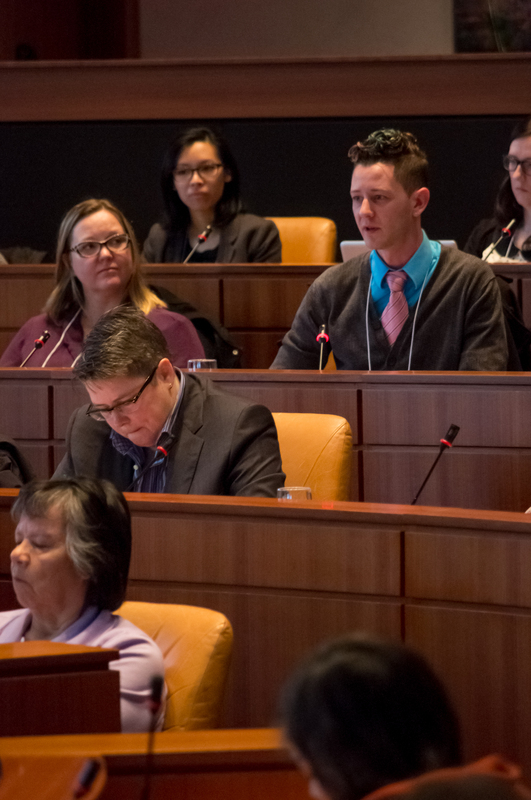 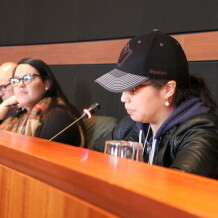 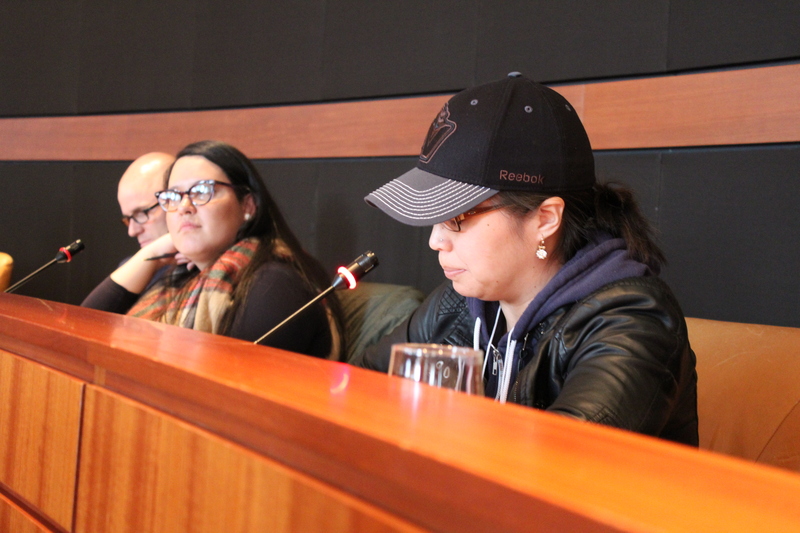 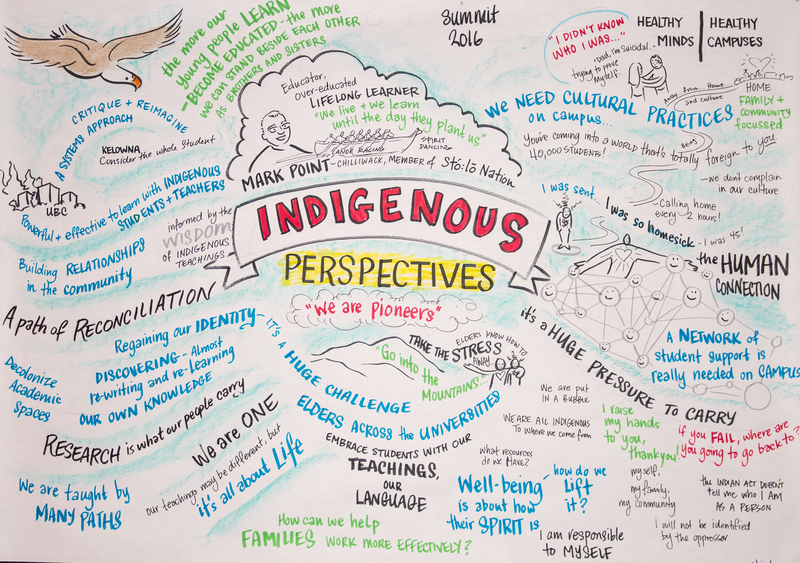 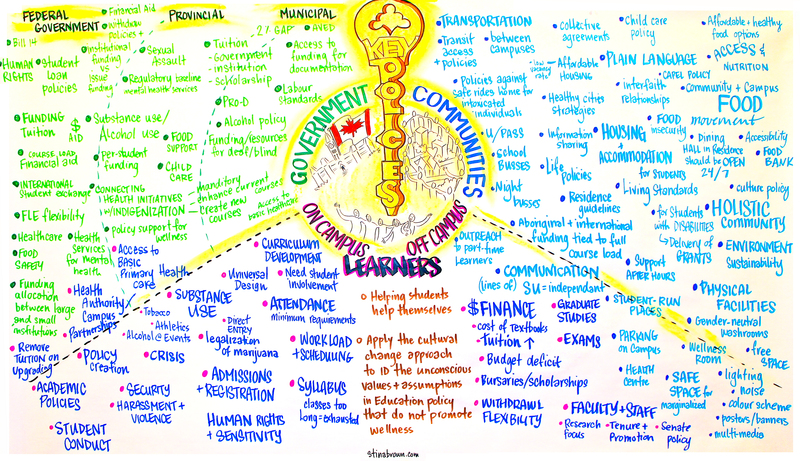 Dialogue focused on cultivating a culture of campus mental health and well-being, Indigenous perspectives, and mapping post-secondary policies. 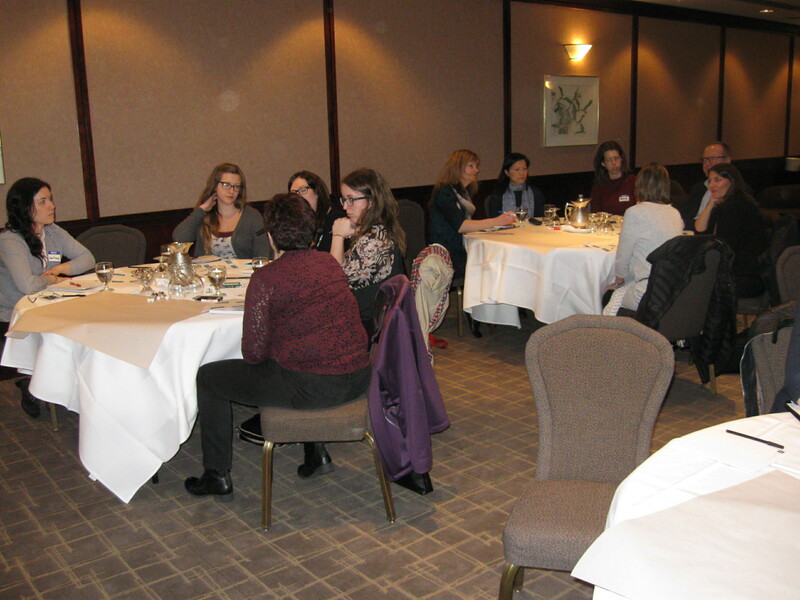 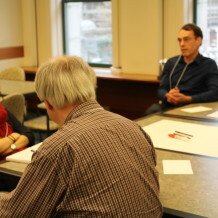 Participants strategized how to mobilize the Okanagan Charter: An International Charter for Health Promoting Universities and Colleges. 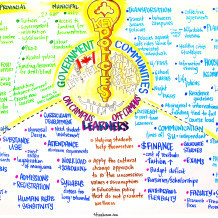 They reflected on how BC can respond to the call to action for universities, colleges and institutes to infuse well-being into everyday operations, business practices and academic mandates and by doing so, enhance the success of our institutions and provide transformative educational environments that enable all stakeholders on campus to become engaged citizens and leaders. 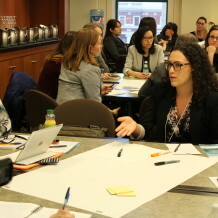 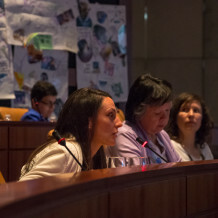 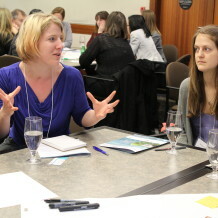 In addition to meaningful dialogue and co-creation together, participants took part in “Deep Dive Working Sessions” and had the opportunity for knowledge exchange at the “Pop-Up Market for Innovations.” The purpose of the working sessions was to leverage skills from across the province to enhance collective capacity. 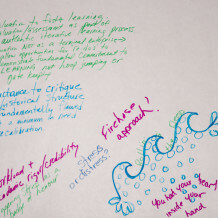 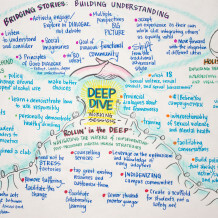 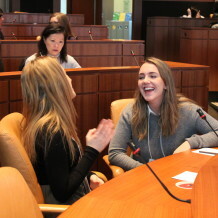 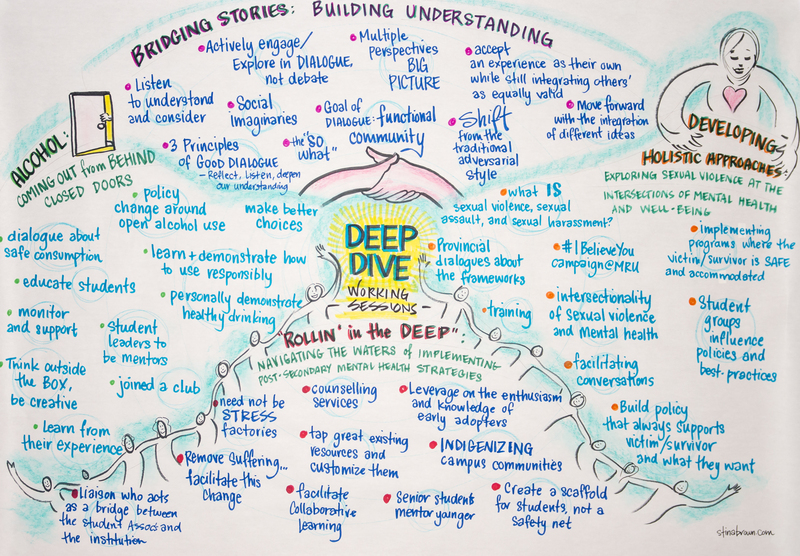 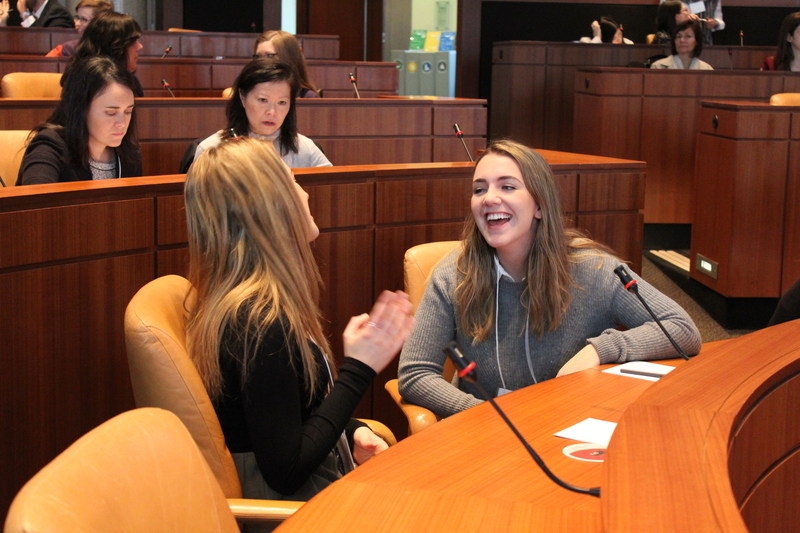 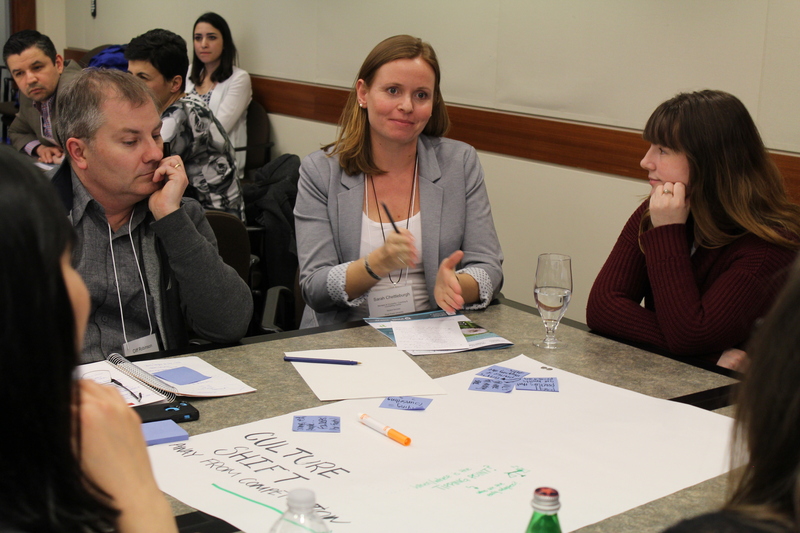 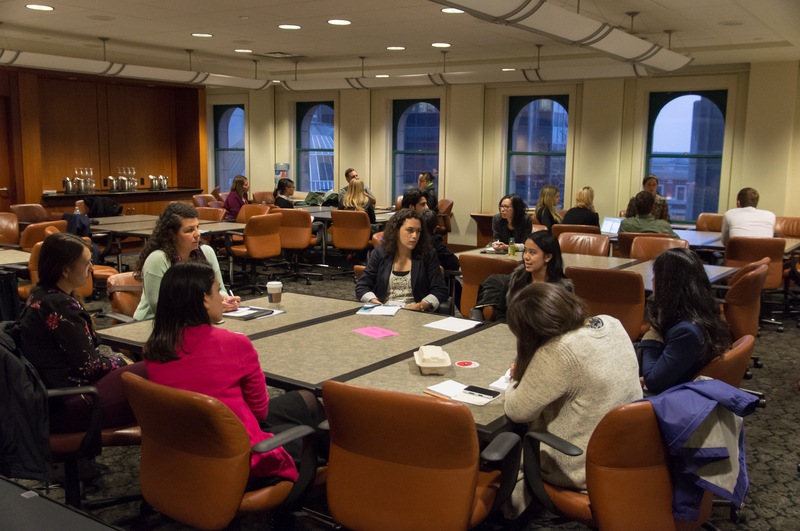 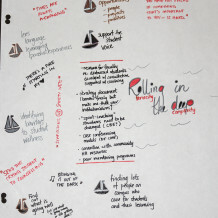 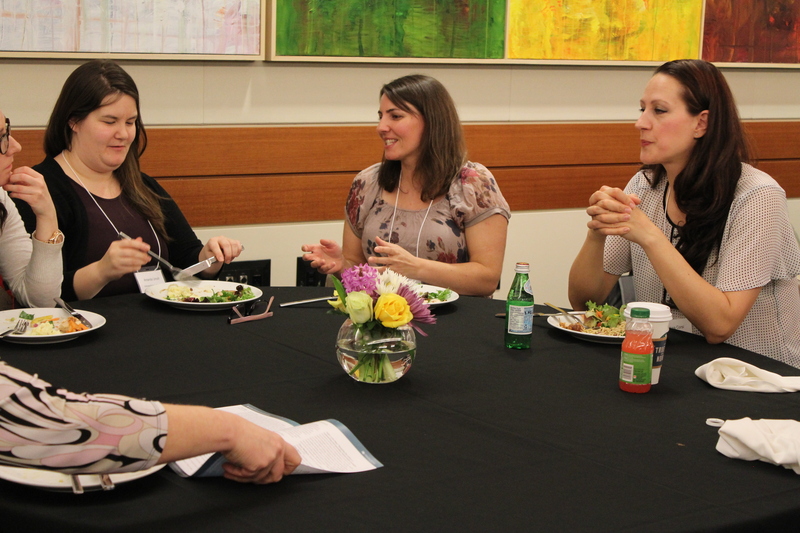 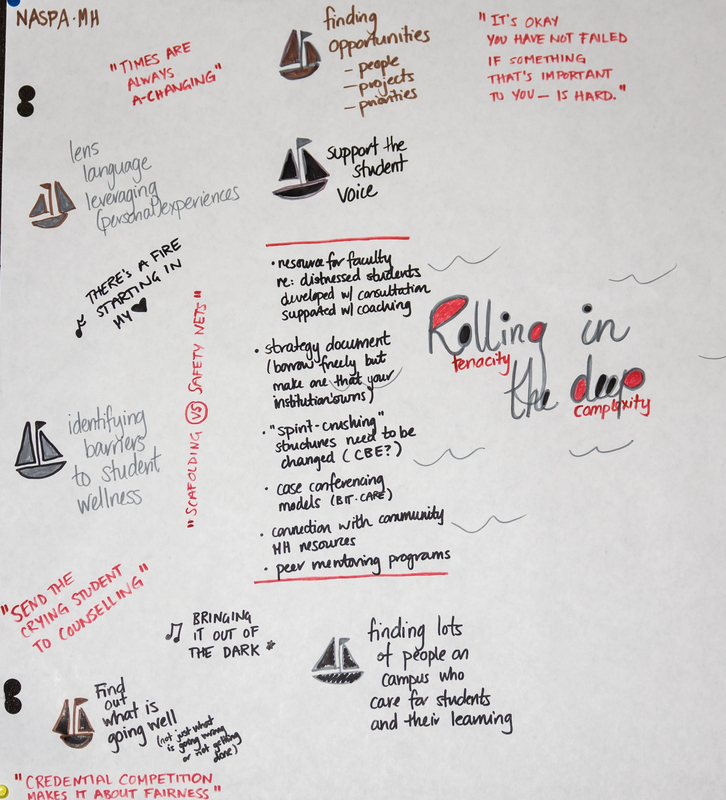 The Deep Dive Working Sessions were held on topics such as developing campus mental health and well-being strategies, applying a “mental health and well-being lens” to post-secondary policies, learning environments, sexual violence prevention, alcohol policies and more! 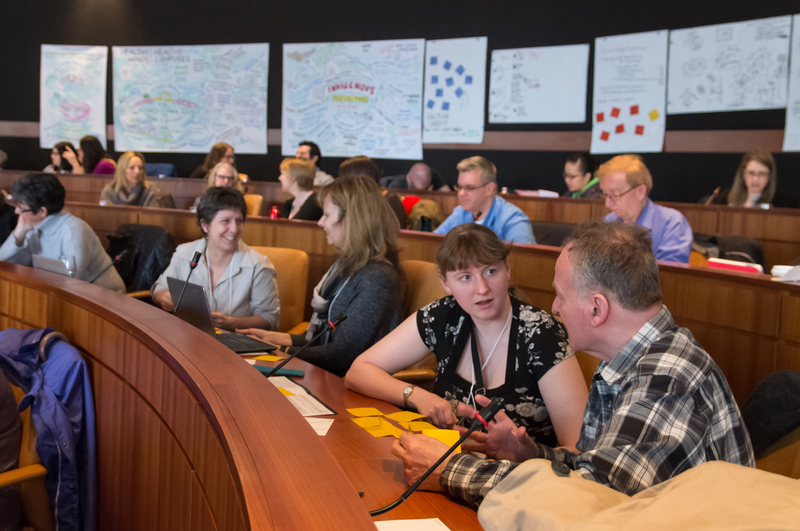 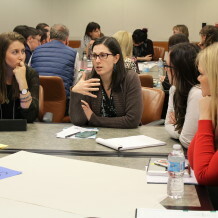 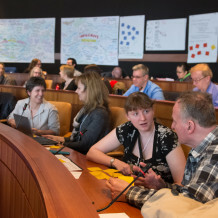 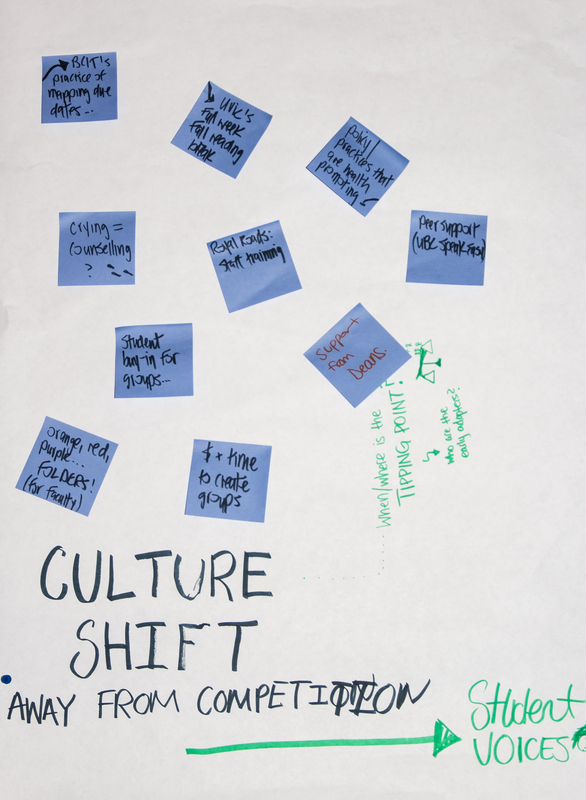 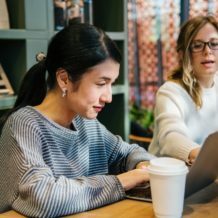 Additional concurrent sessions focused on solution seeking and sharing among peers, where participants divided into their “peer groups” and use open space methodology to learn, explore and plan together. 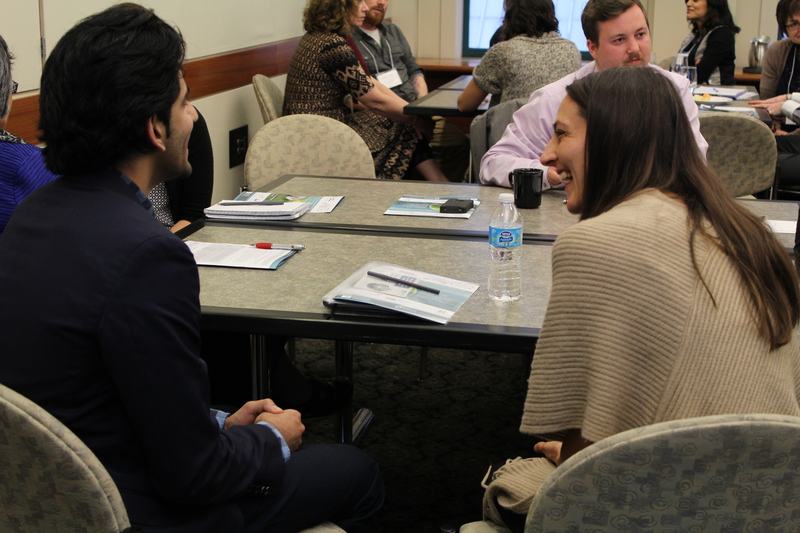 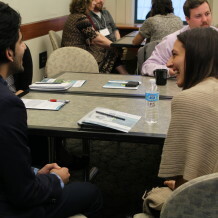 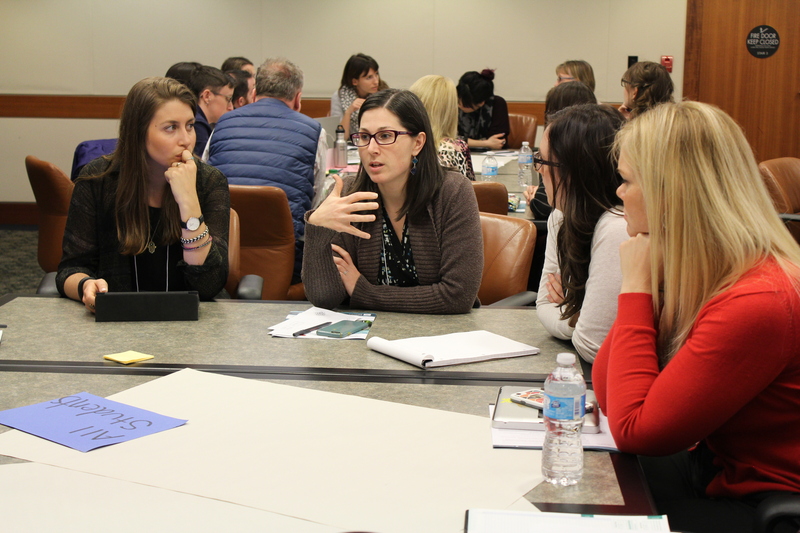 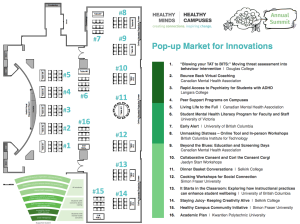 During the “Pop up Market for Innovations,” delegates had the opportunity to learn about a variety of promising practices across the continuum — from crisis response and services to supportive environments — and heard from other stakeholders what has worked well on their campus. 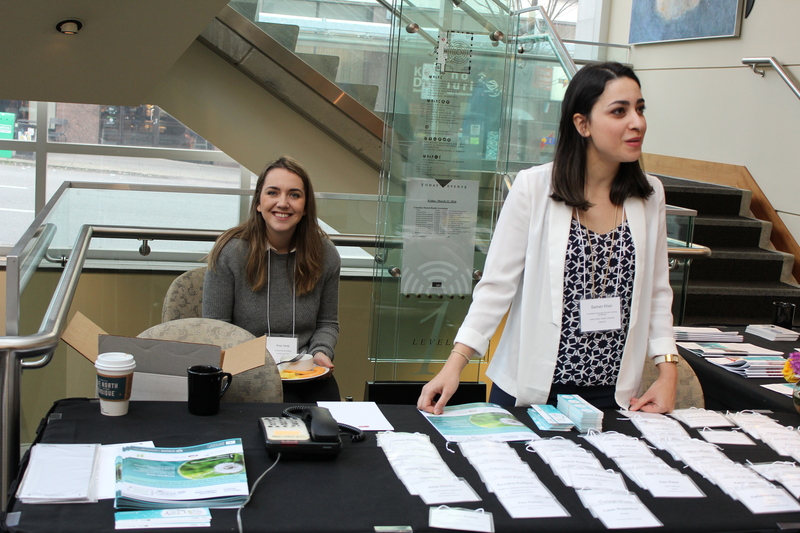 Summit participants were invited to participate in a variety of networking activities, including an evening reception, morning yoga session and more. 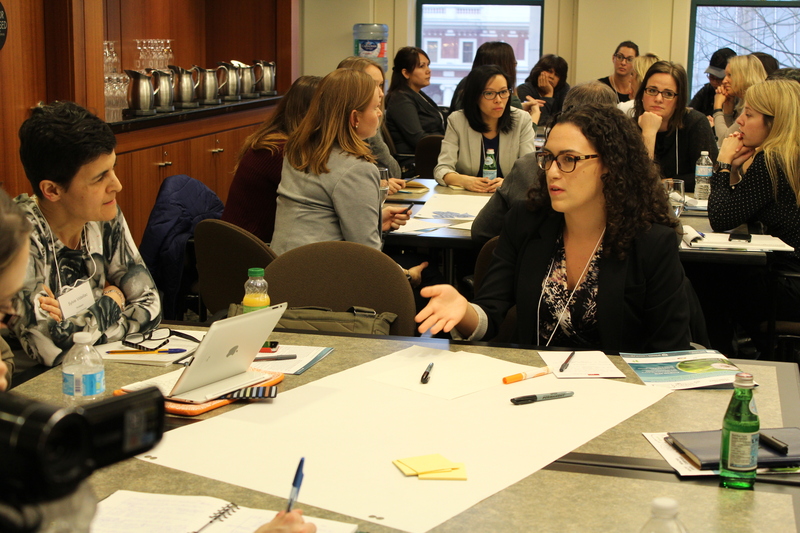 Special thank you to our multi-stakeholder Summit 2016 Planning Committee, which includes professional and student representatives from campuses across the province, as well as the Ministry of Health and Ministry of Advanced Education. 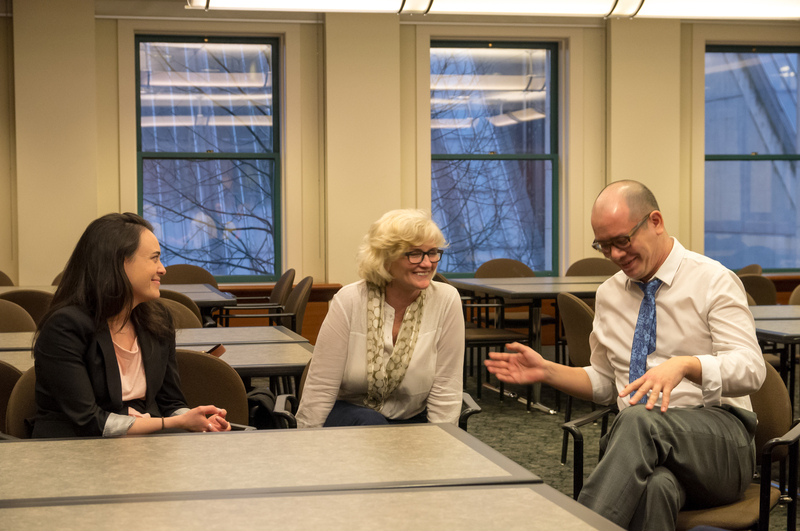 We are also grateful for the additional financial support provided by the Rossy Family Foundation. 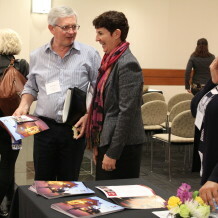 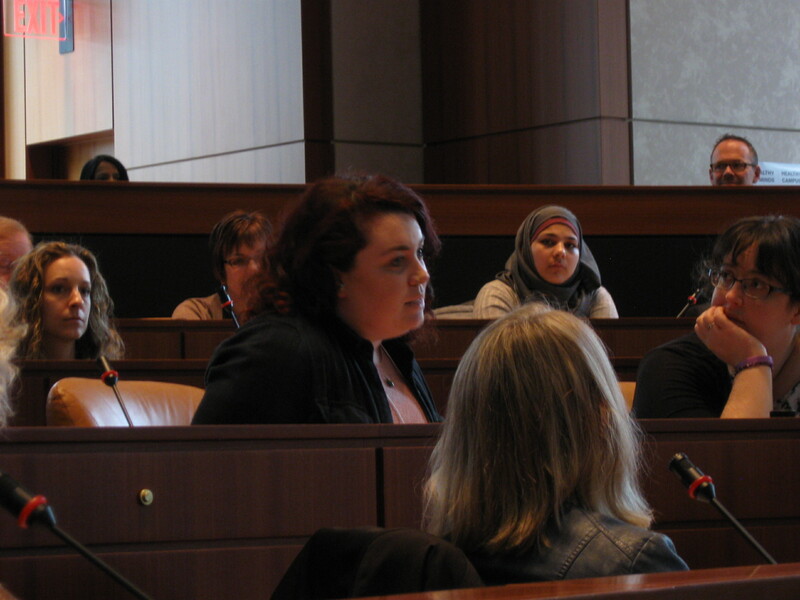 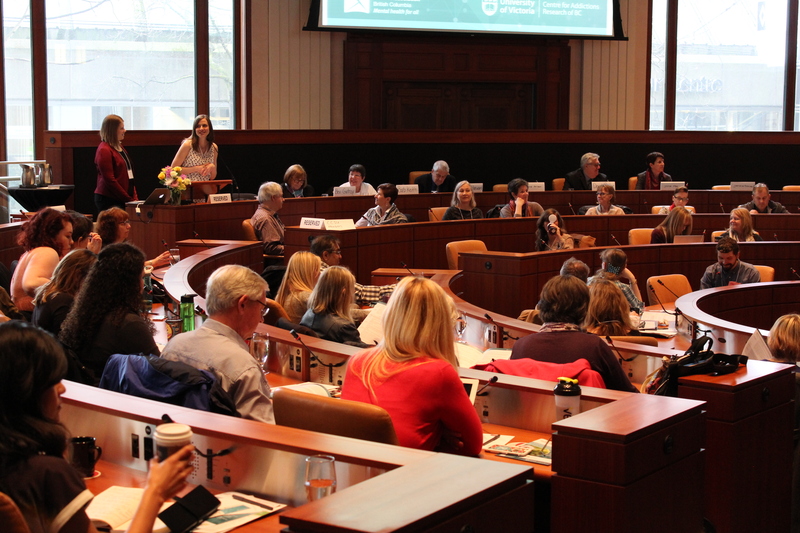 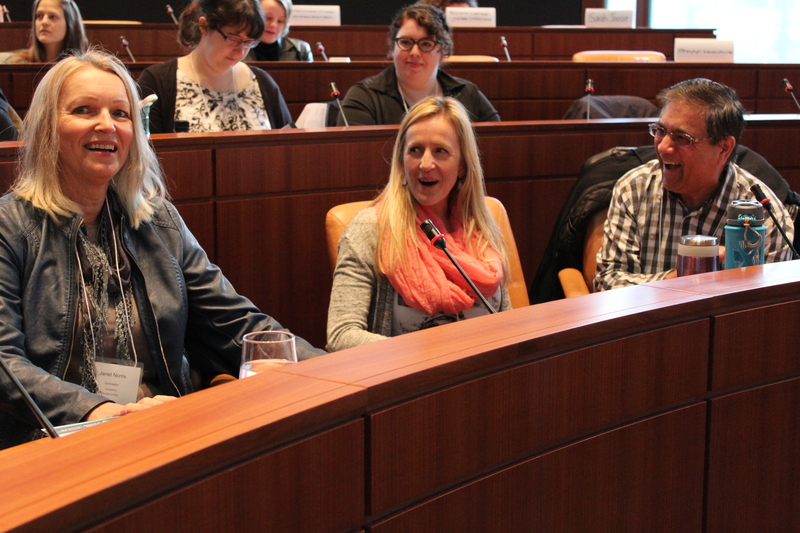 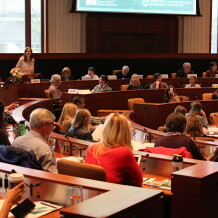 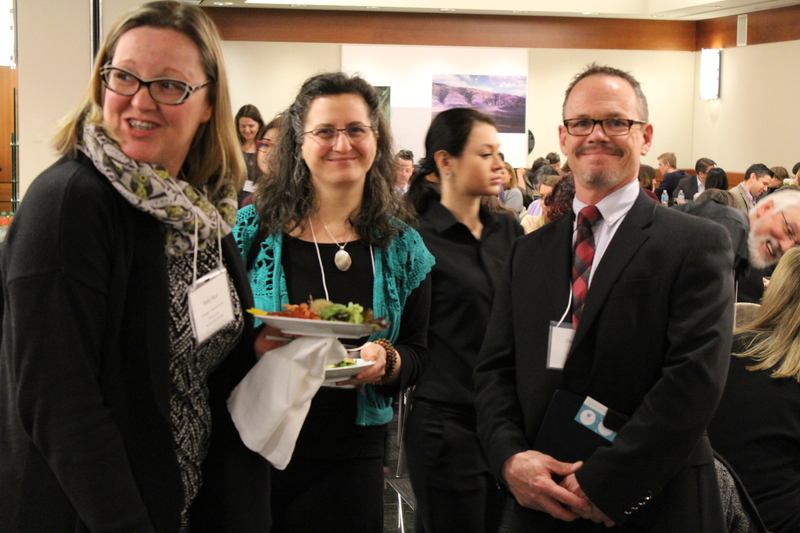 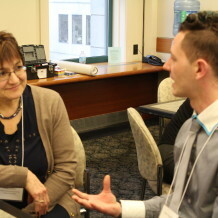 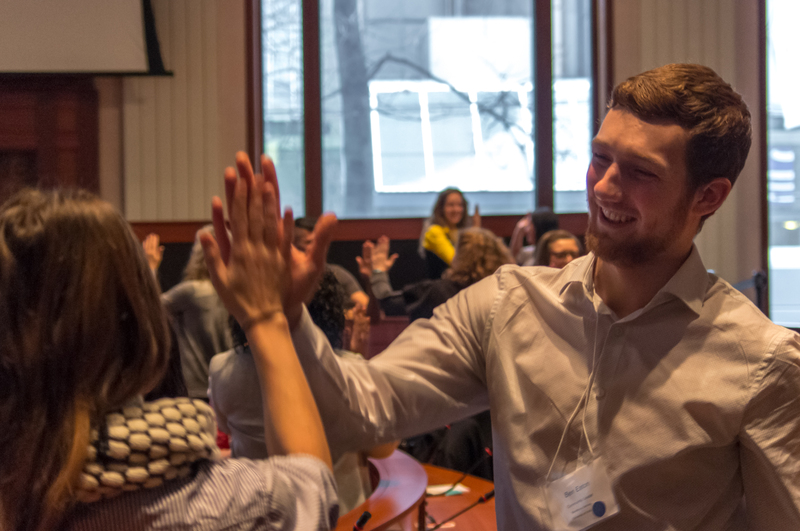 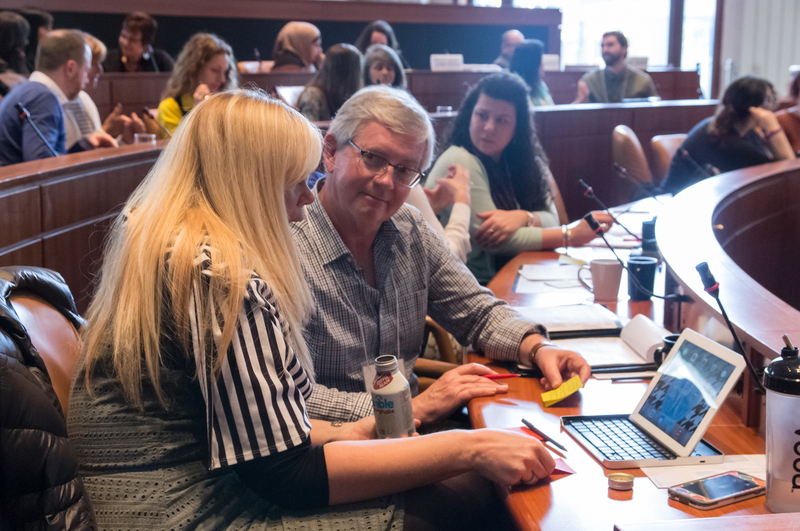 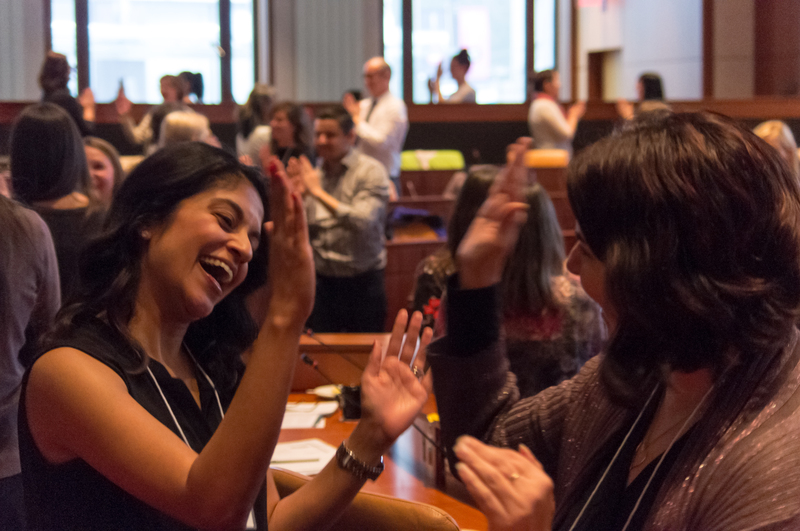 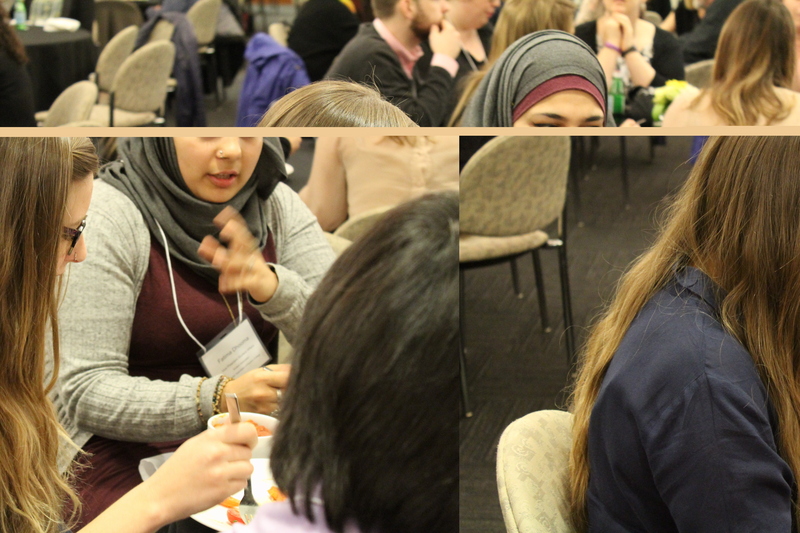 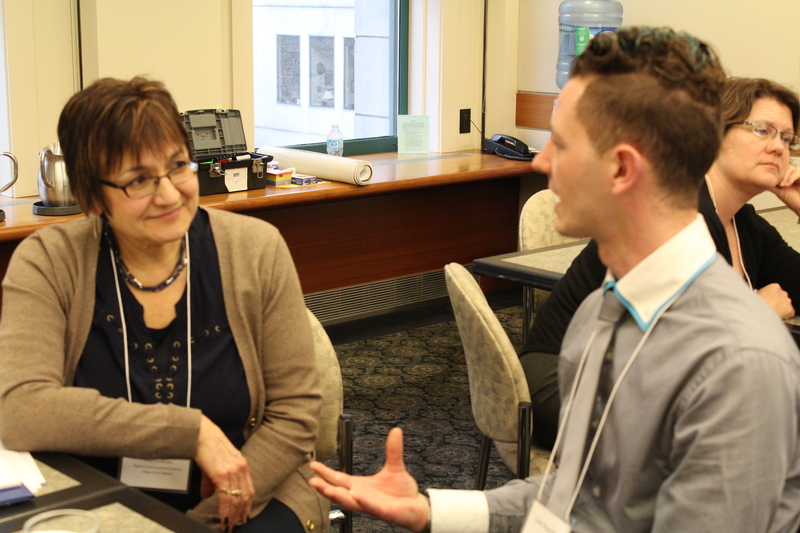 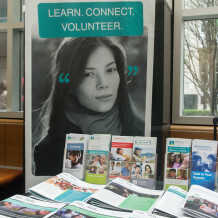 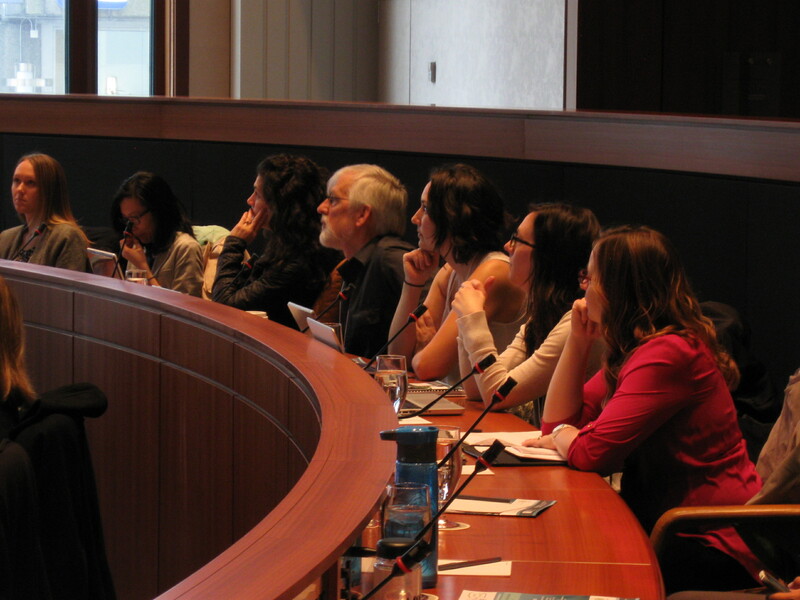 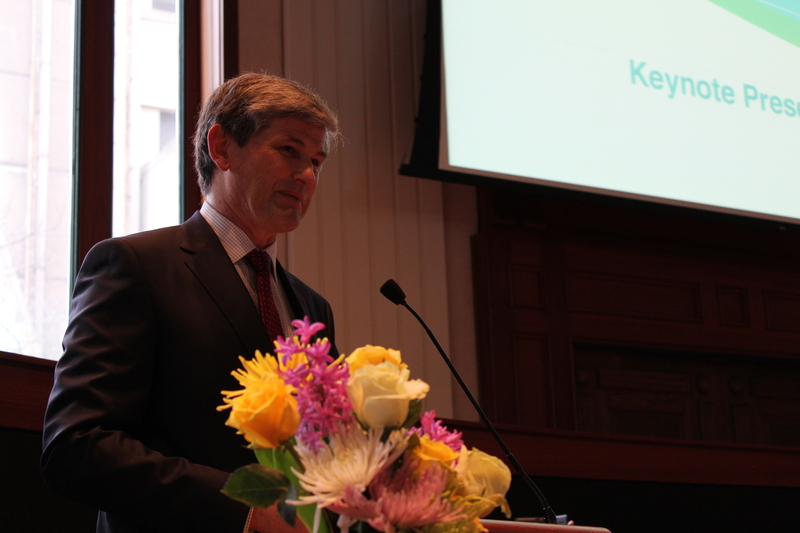 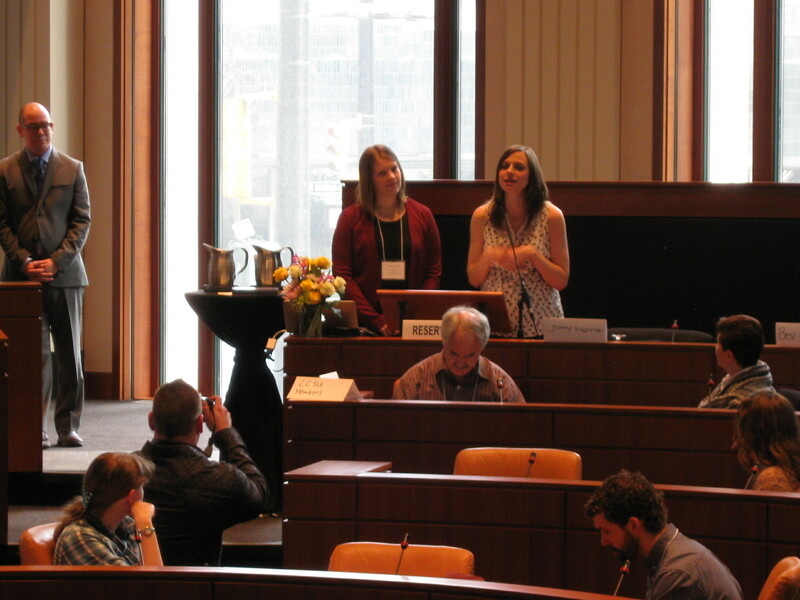 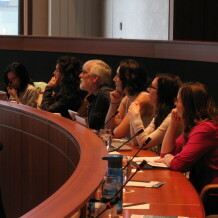 We were thrilled that representatives from every public post-secondary institutions in BC attended the Summit, in addition to representatives from other institutions across the province, government partners and community organizations. 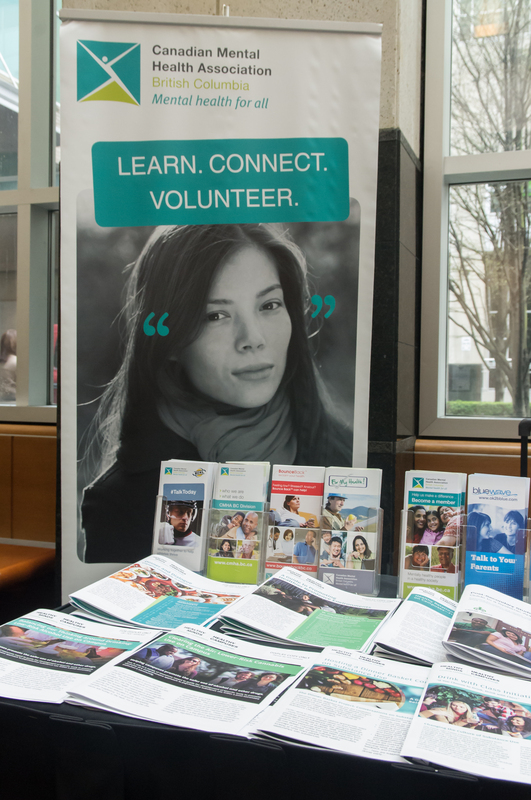 For full details on how the registration process worked for 2016, click here >>> . 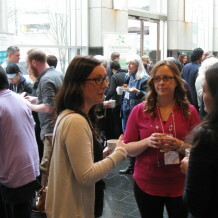 Summit participants were invited to stay at The Metropolitan Hotel. 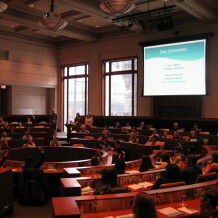 This unique boutique-style hotel is located in the heart of downtown Vancouver at 645 Howe Street, was only a 7 minute walk from the Summit venue. 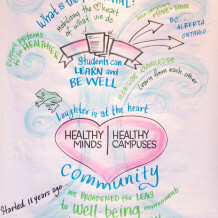 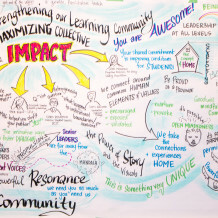 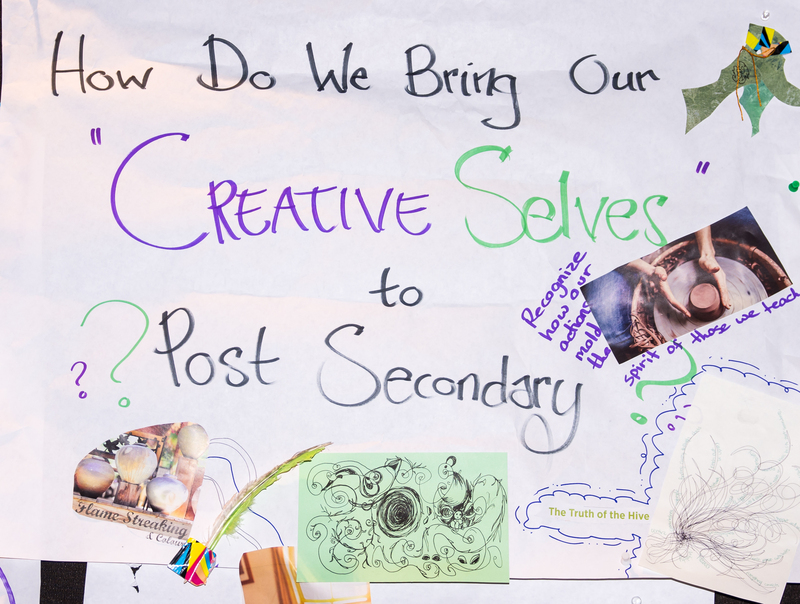 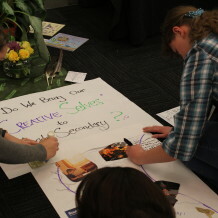 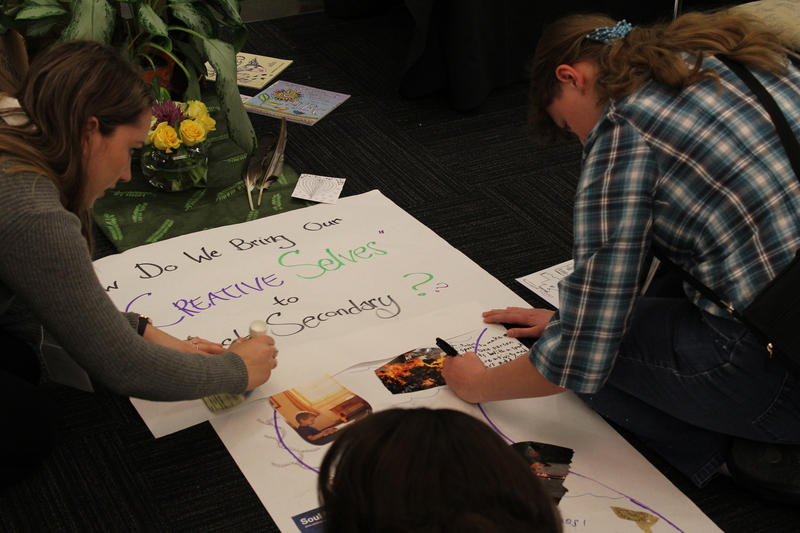 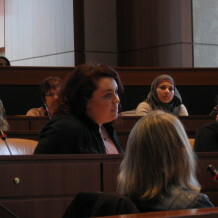 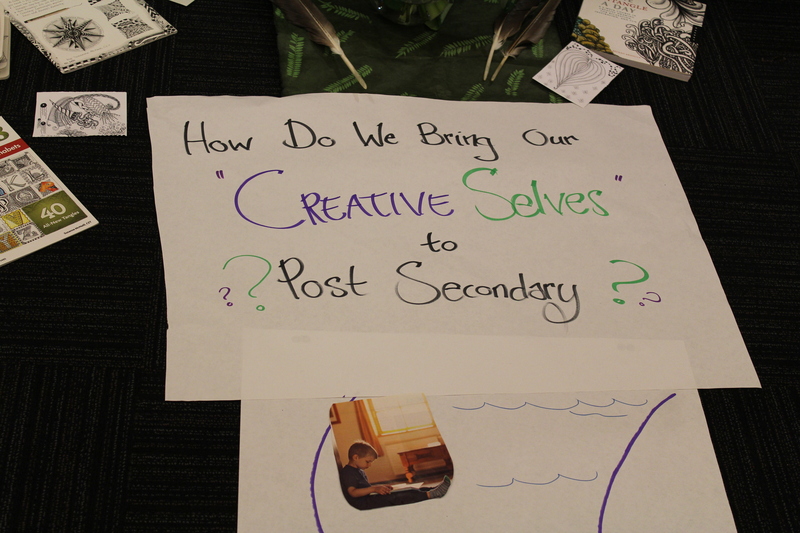 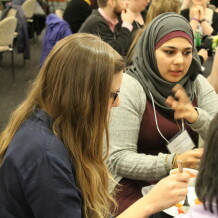 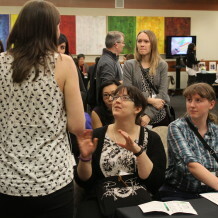 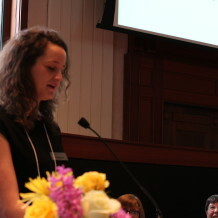 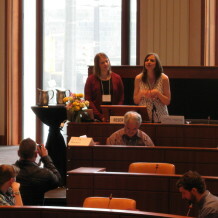 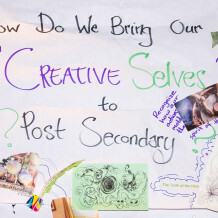 Selkirk College Student Reflection from CMHA BC on Vimeo. 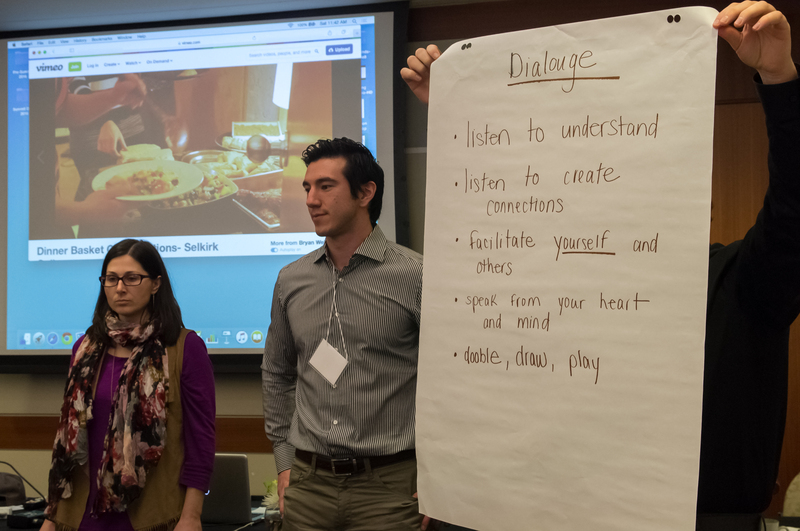 "For me these Summits have been life-changing and have shaped much of my philosophy around community development and well-being and I would love for more people to have the opportunity to engage deeply with this wonderful provincial community of students and educators." 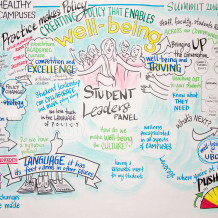 "As a result of Summit 2016 I feel inspired to further the dialogue about mental health on my campus and I feel the need to educate myself further on mental health so that I can become a more well-informed advocate." 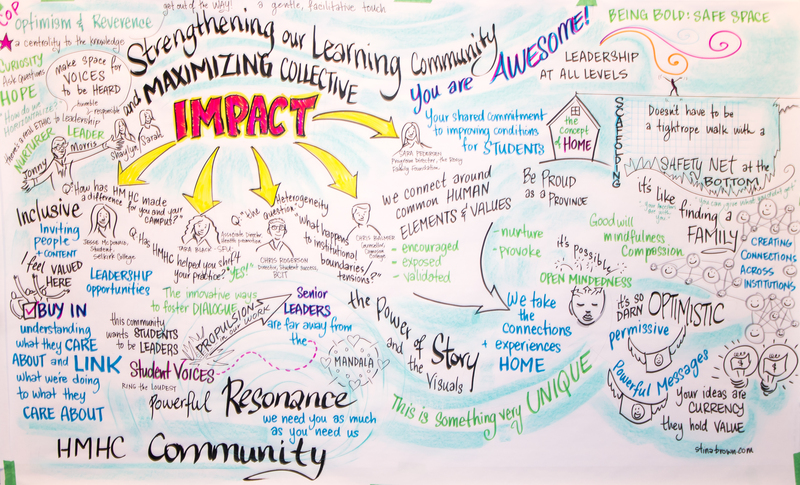 " 'Amazing' isn't enough, but it's adequate to describe my experience at the Summit. 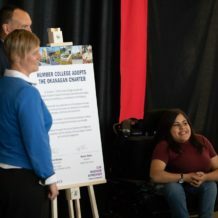 I was so impressed to see the strong collaborative efforts of students, instructors, staff, and community members in an environment that was so united to promote mental health awareness and change." 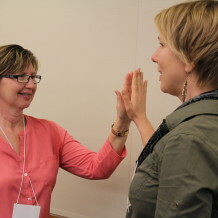 "Absolutely positively incredible, informative, and energetic. 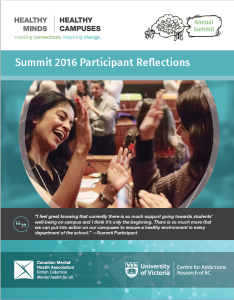 The overall vibe and level of practical enthusiasm at this Summit was incomparable to any other Summit/conference that I have attended." 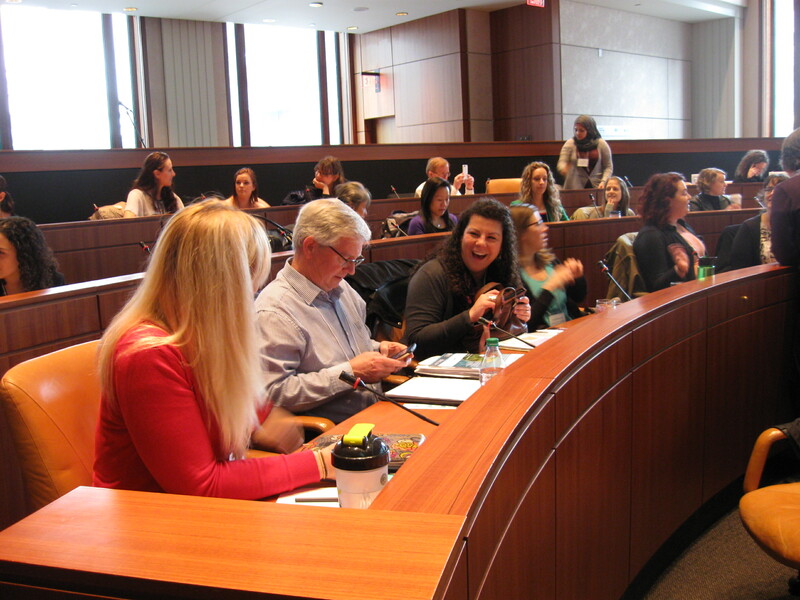 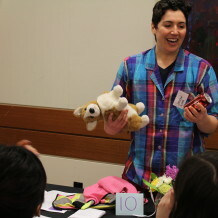 "Extremely well organized with a vibrant and diverse group of attendees. 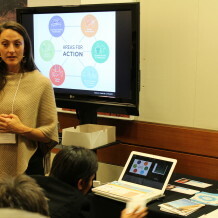 Very action oriented and a good mix of practice and theory. 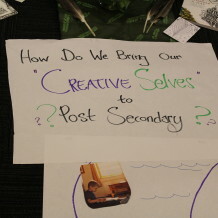 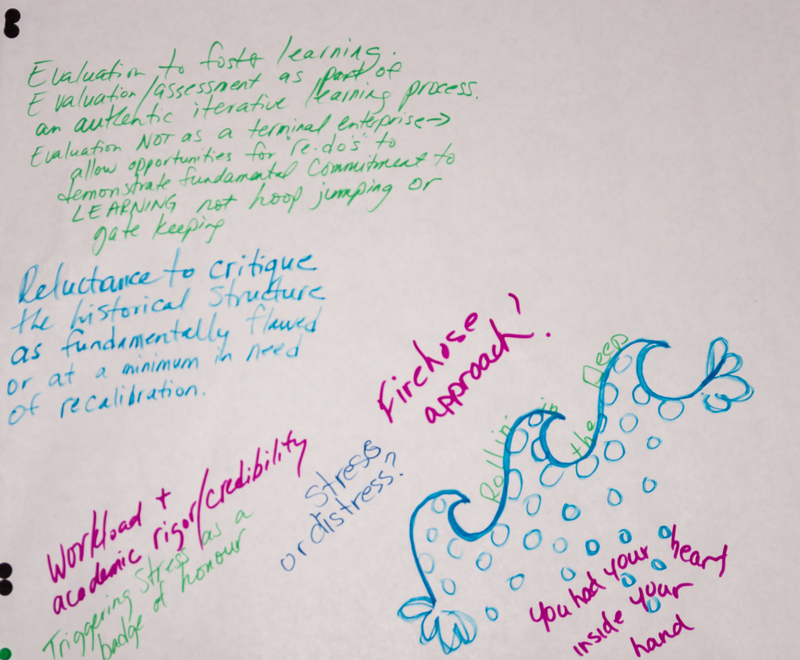 Loved the ability for everyone to feel like active contributors - particularly the student voice." 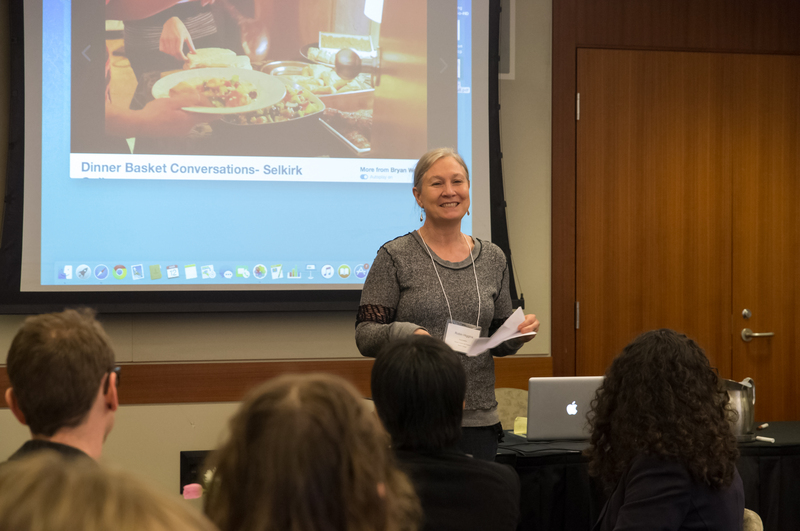 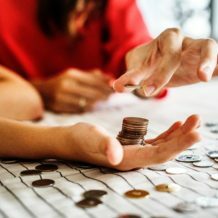 "As a result of Summit 2016 I will be approaching my work with a renewed sense of vigor and knowing there are others out there who I can call upon for ideas, support, and encouragement who understand the context in which I work." 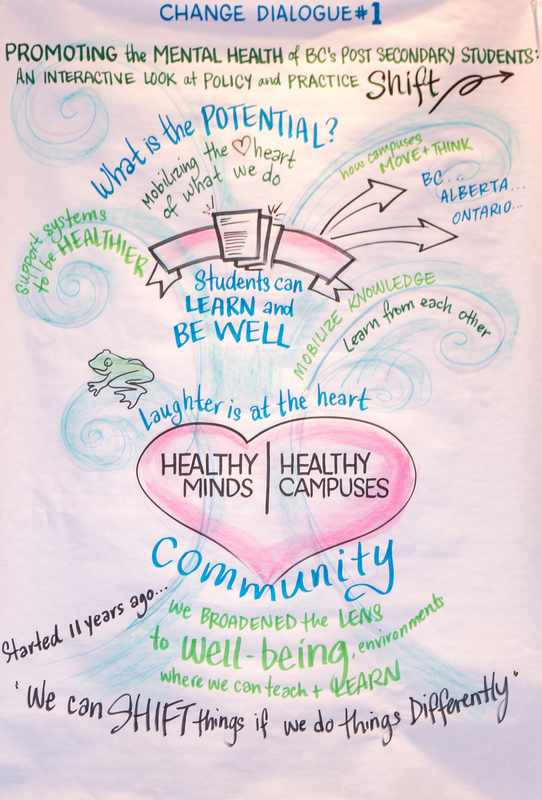 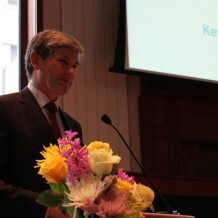 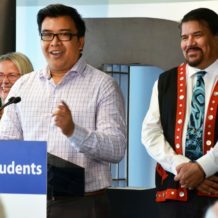 "As a result of Summit 2016 we are more connected as a province, and that connection will strengthen the commitment to post-secondary wellness."